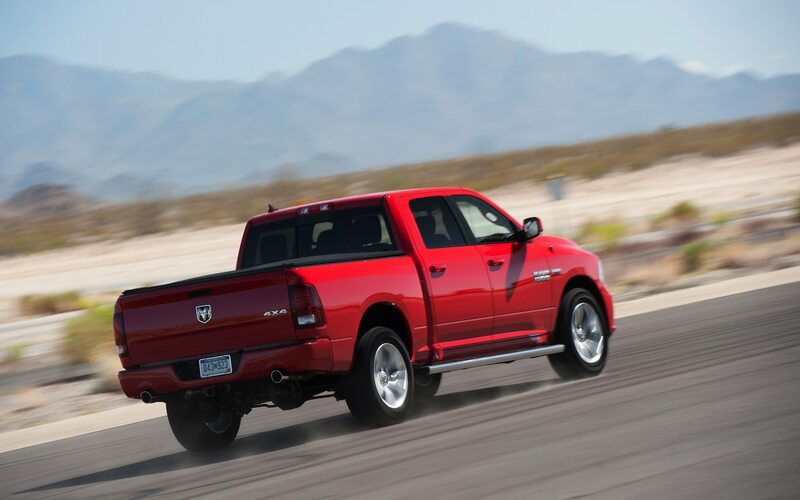 For several years, it seemed all we ever talked about with trucks was torque and tow ratings. 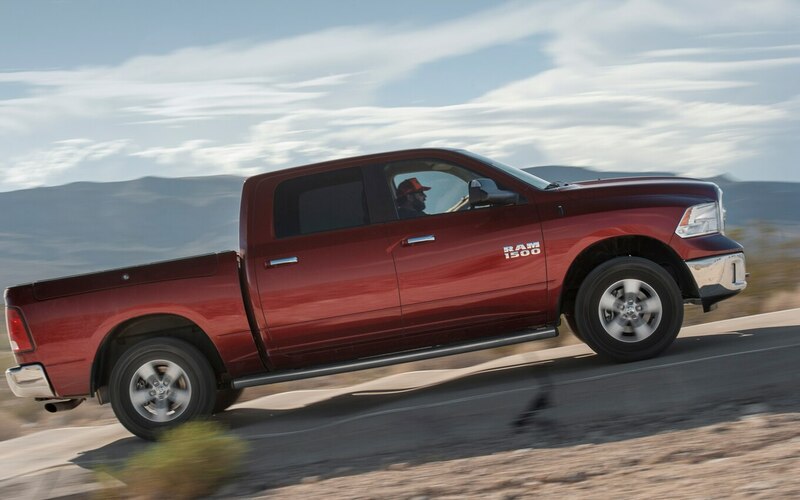 Things have changed, with truck buyers’ expectations reaching a long way off the farm or job site. 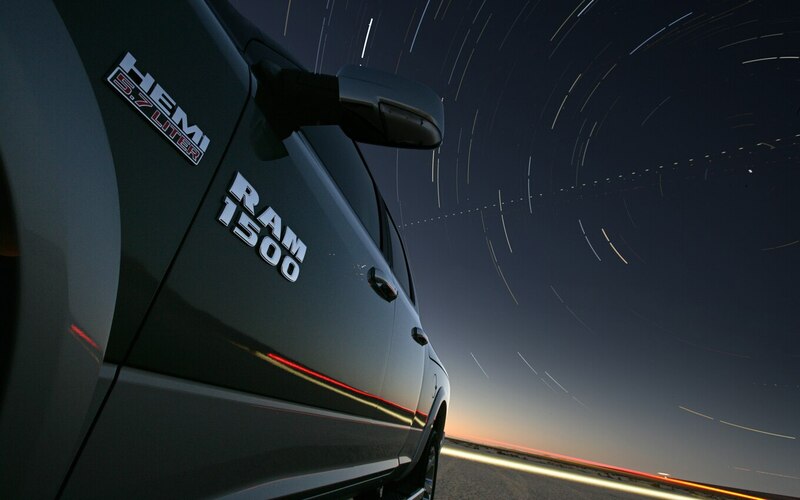 There’s no single magic bullet that will meet every truck owner’s needs, so even an entry payload model range like the Ram 1500 has to have far more breadth and depth than its forebears of a decade ago did. 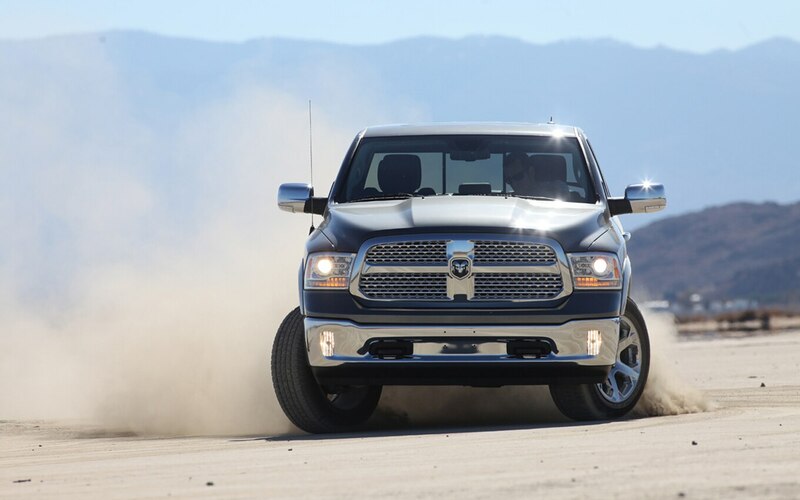 To demonstrate its half-ton’s ability to cover the entire market, Ram delivered a V-6-powered SLT on the efficient and luxurious side and a V-8 powered Sport leaning toward power and performance. 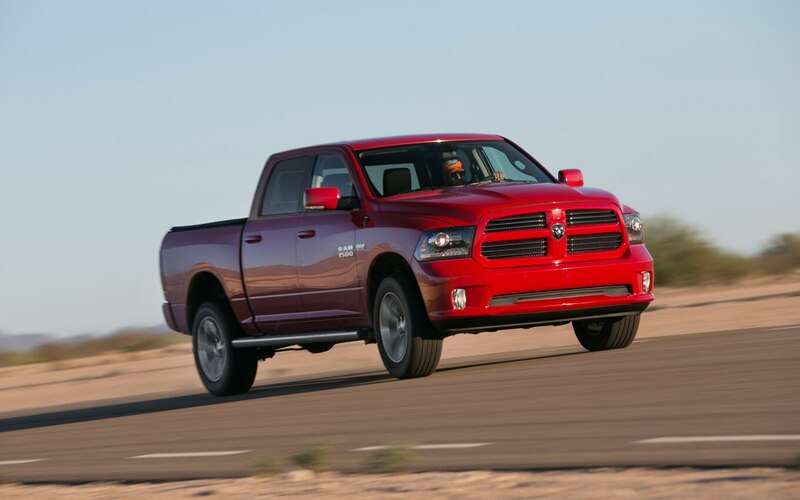 While the 5.7-liter Hemi V-8 isn’t all-new, it is updated with variable valve timing. 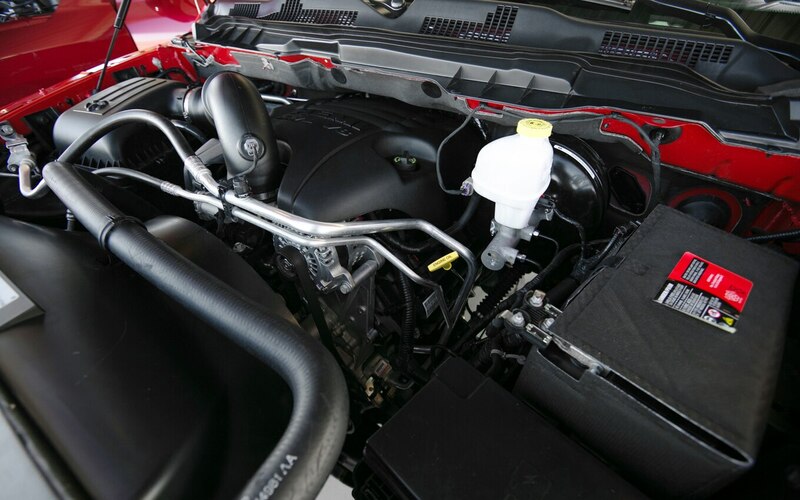 It is bolstered by more efficient systems within the truck including a revised cooling system, electric power steering, and an electrical system with pulse width modulation that more efficiently uses power to lessen load on the alternator. 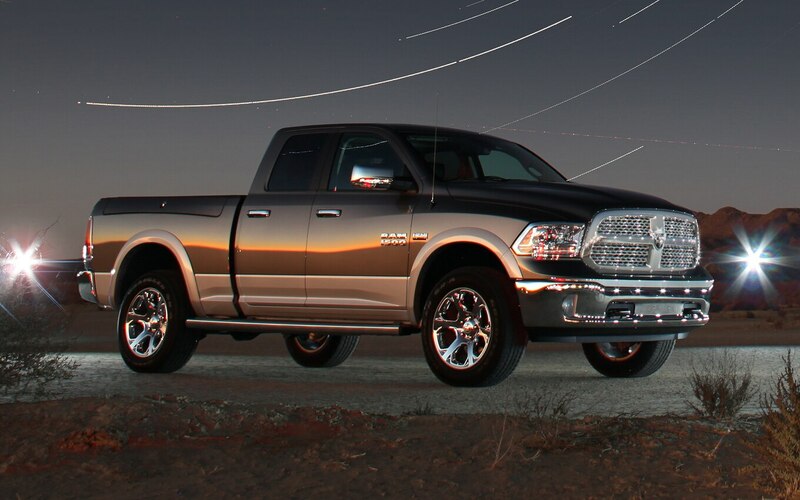 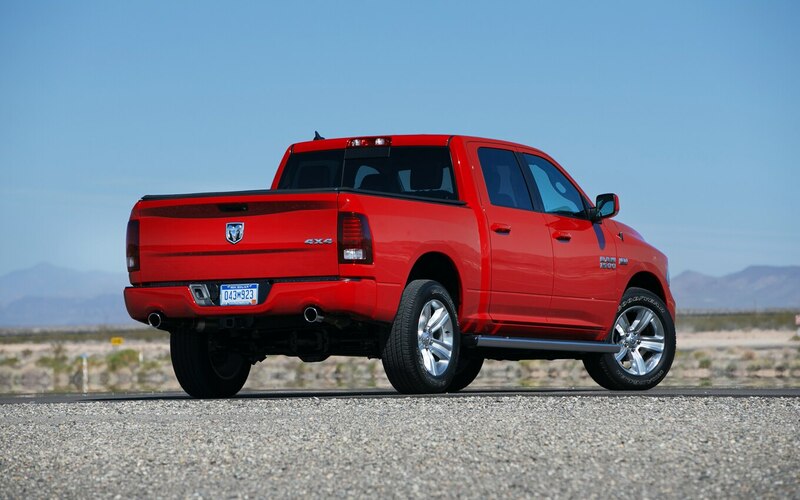 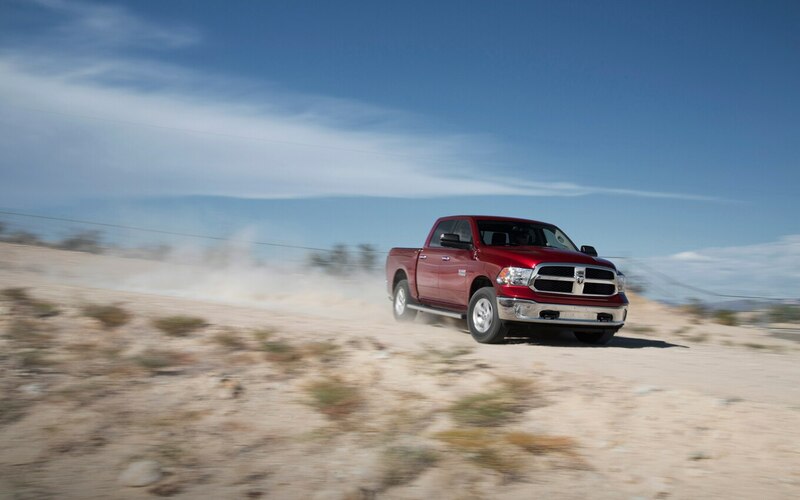 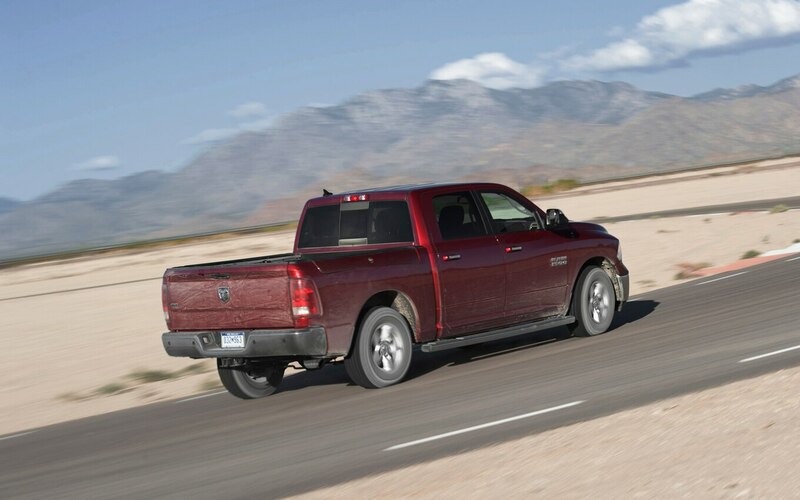 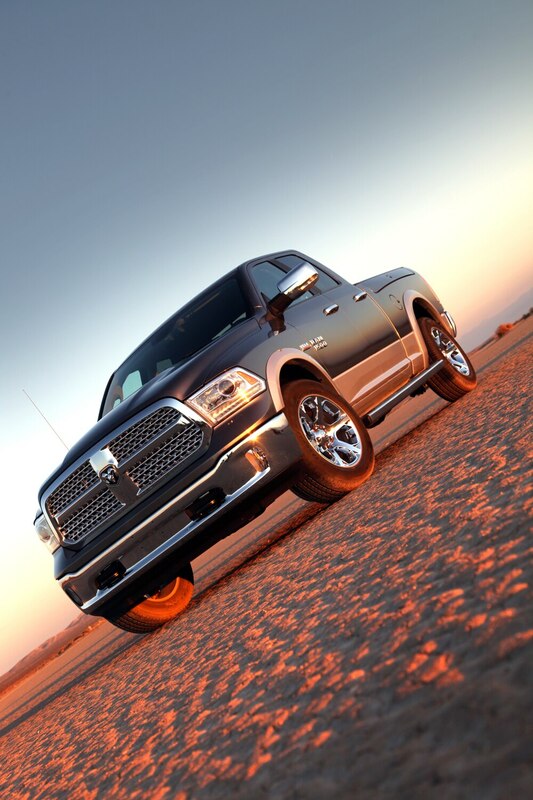 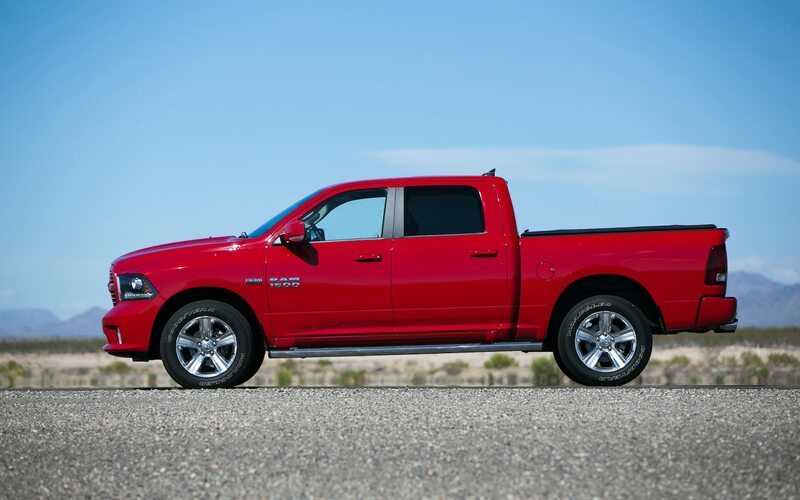 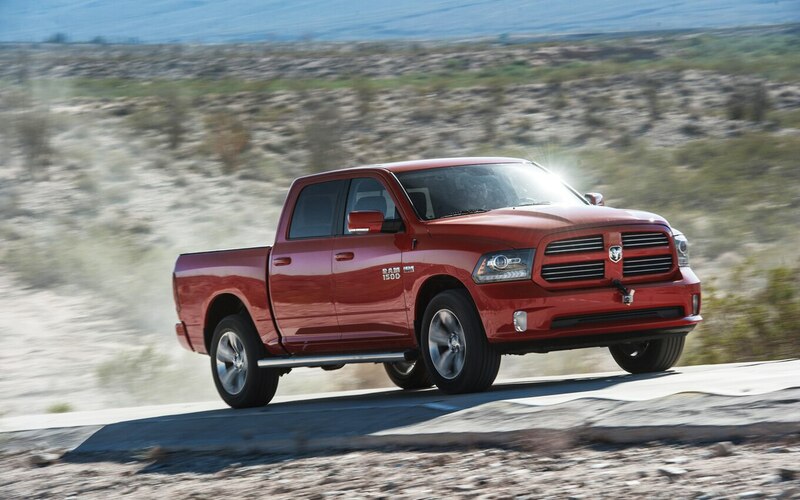 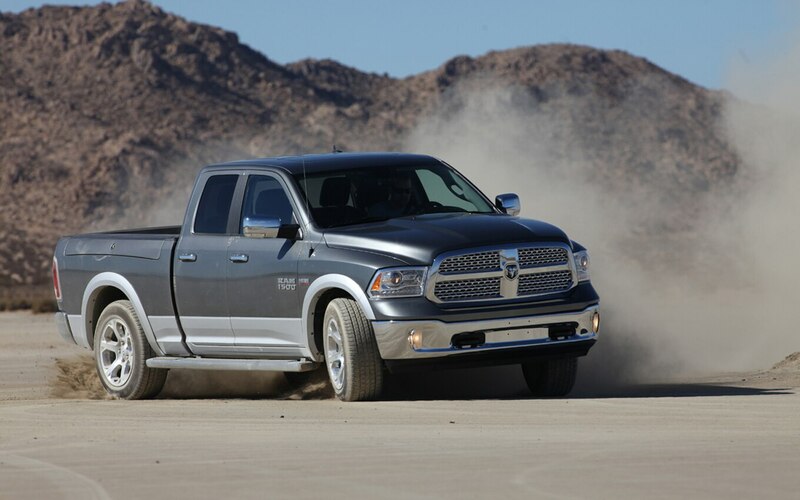 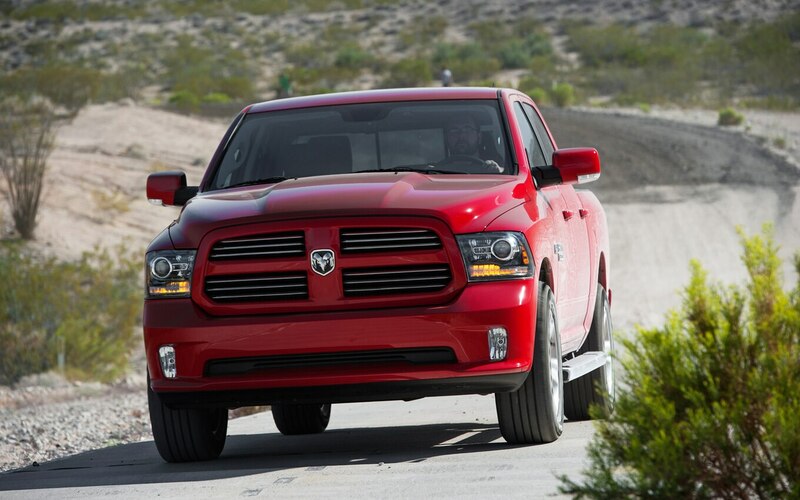 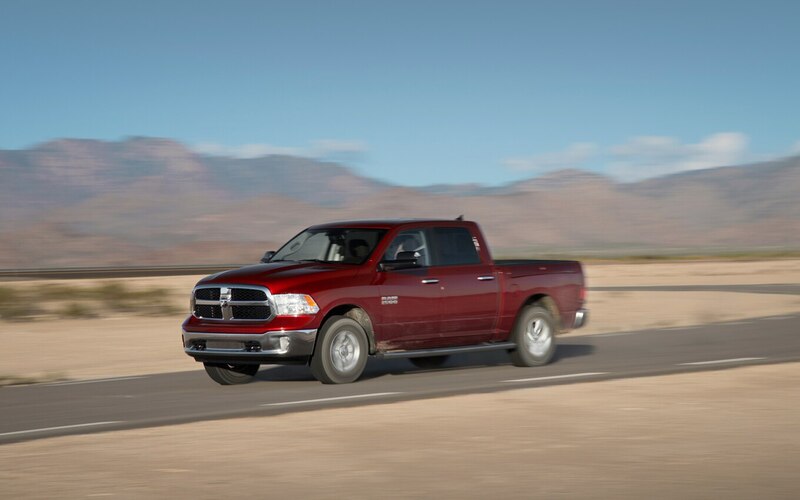 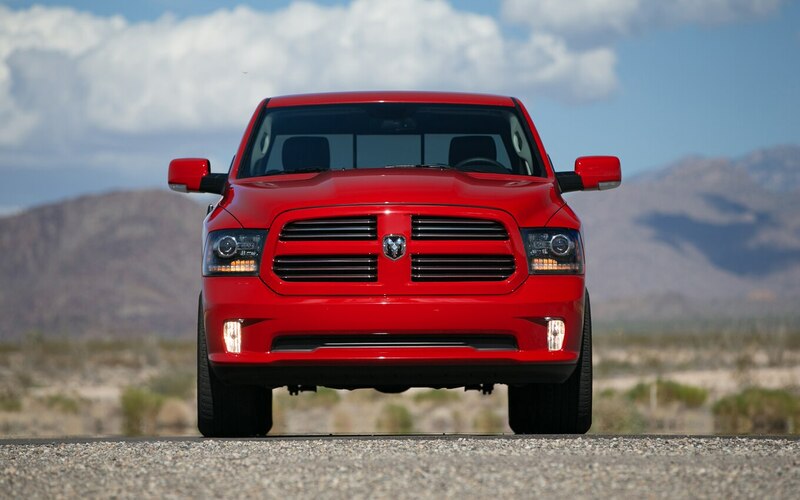 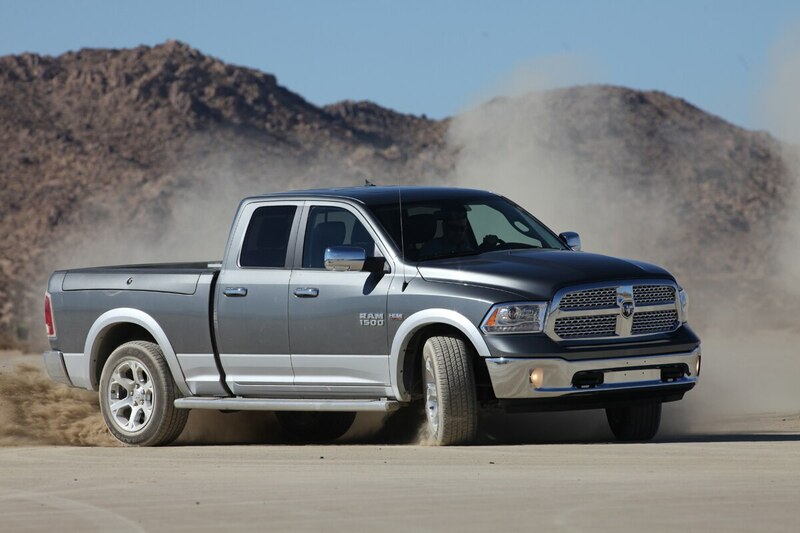 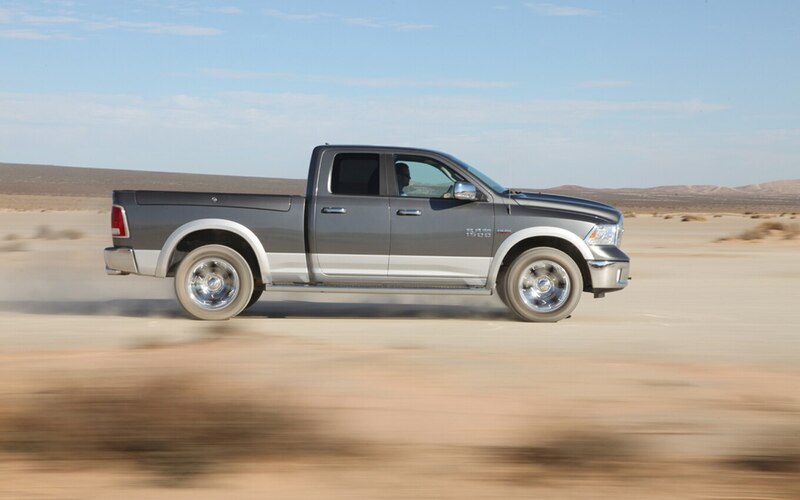 These technologies combine to allow Ram to claim best-in-class fuel efficiency in the V-6 and V-8 segments. 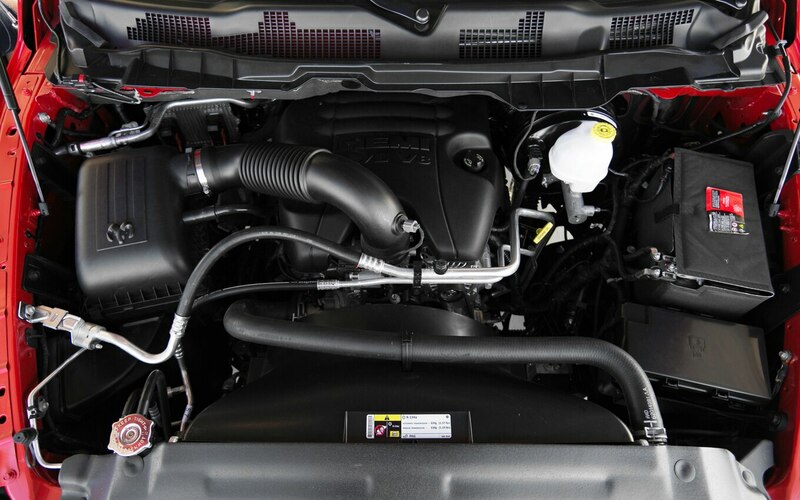 It should be noted that, since the Ford EcoBoost is considered a V-8 alternative, it’s lumped into the V-8 segment. 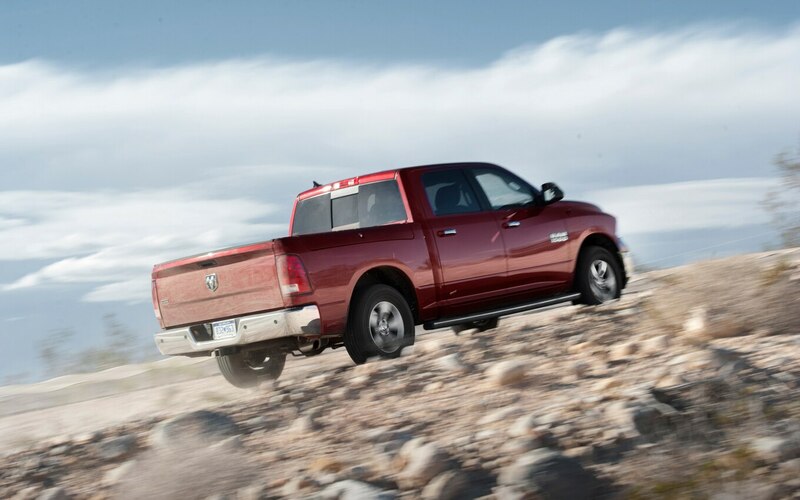 While many people focus on a truck’s powertrain, that may be the least significant improvement in the 1500. 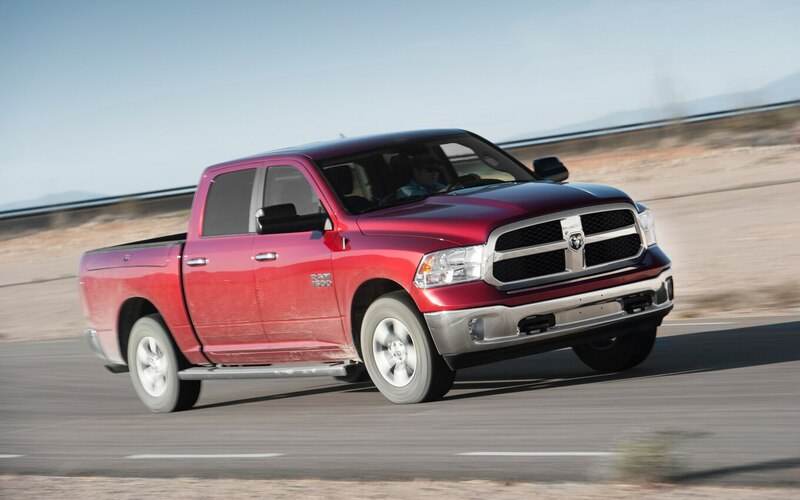 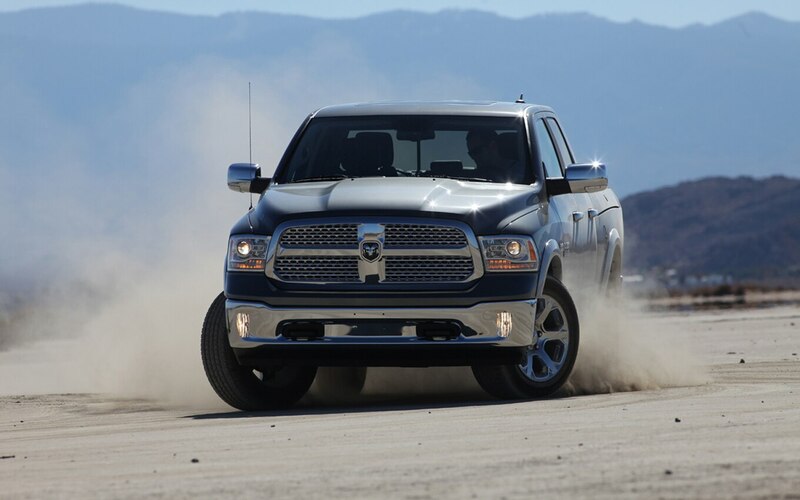 The addition of air suspension is a giant leap for half-ton trucks. 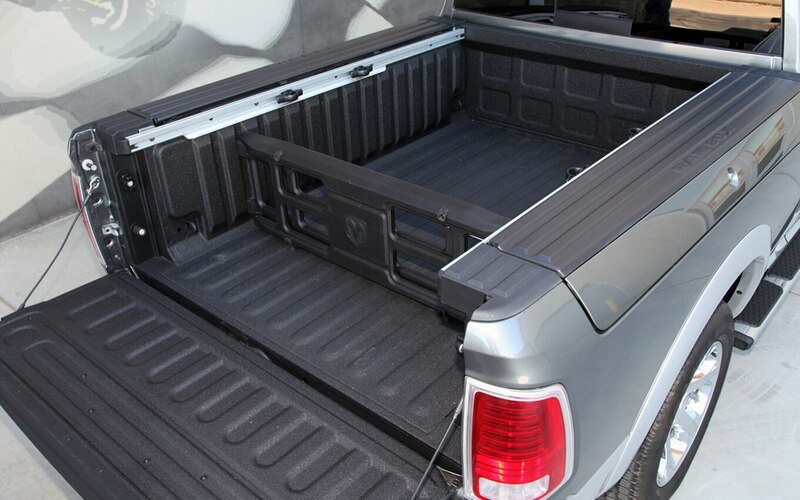 While coil springs are a big advancement over leaf springs, trucks have to be able to carry such a range of weight loads, from a single person to five passengers and a bed full of cargo, that a single spring rate just doesn’t seem adequate. 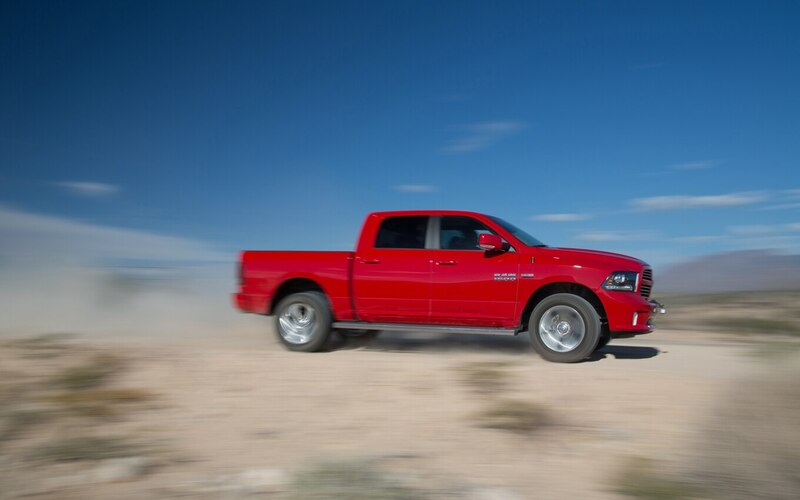 Although the Ram’s air suspension may cause as much concern as Ford’s turbos on the reliability front, we can tell you these modern air springs use materials that are more resistant to tearing and puncture, and they resemble those used on modern luxury cars that can easily weigh as much as smaller trucks. 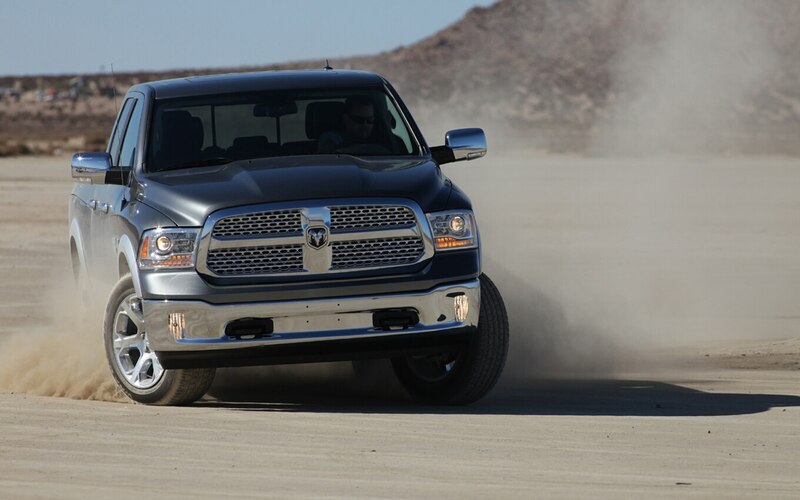 As well as compensating for varying loads an air suspension can provide adjustable ride height. 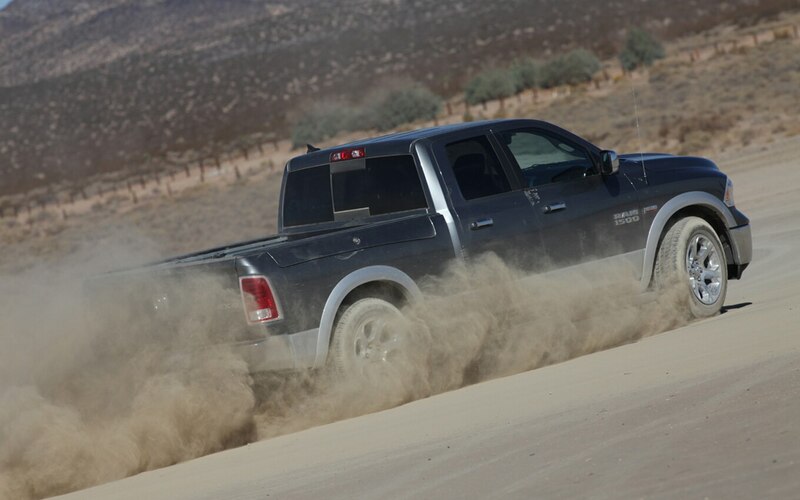 Two off-road modes will lift the truck 1.2 inches and 2.0 inches, respectively, while an aero-mode lowers the vehicle 0.6 inch. 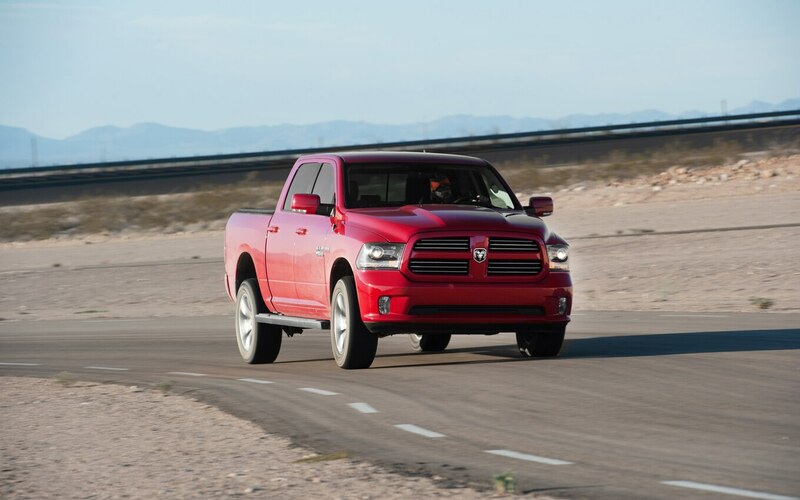 Lowering the vehicle at highway speeds improves aerodynamics, which improves efficiency. 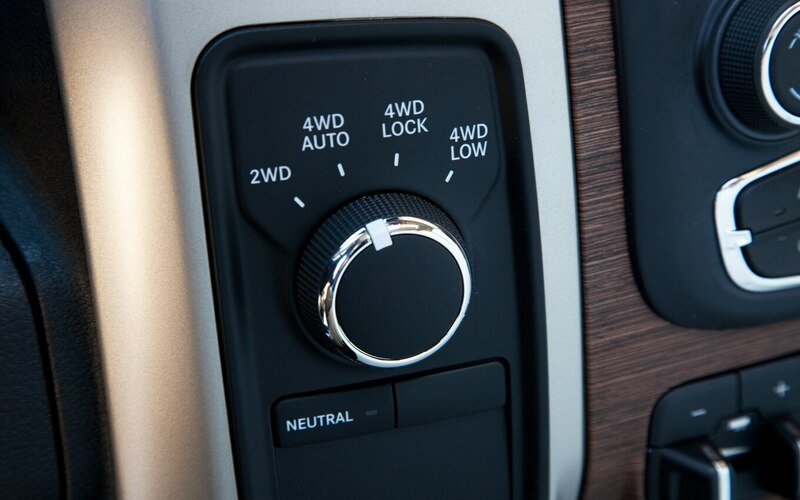 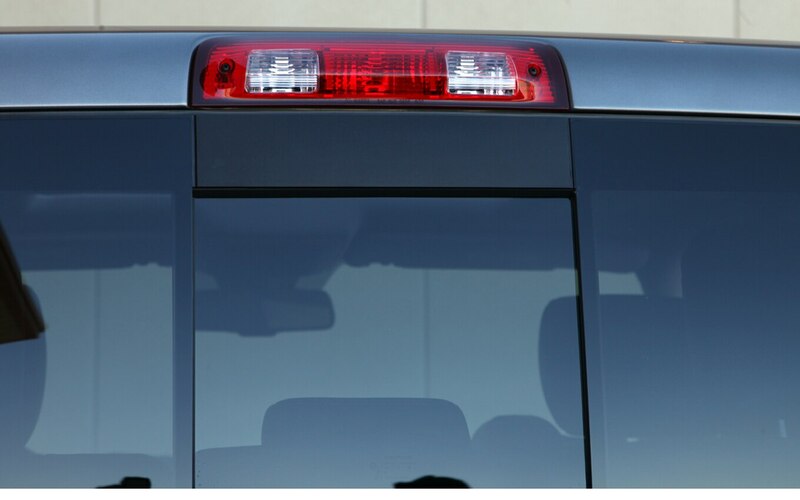 Besides the ride height, optional active shutters in the grille can close at highway speeds helps move air around the truck instead of under it. 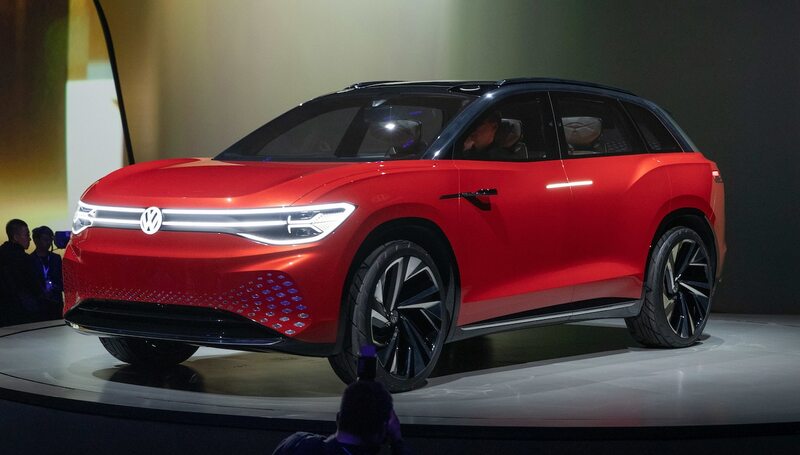 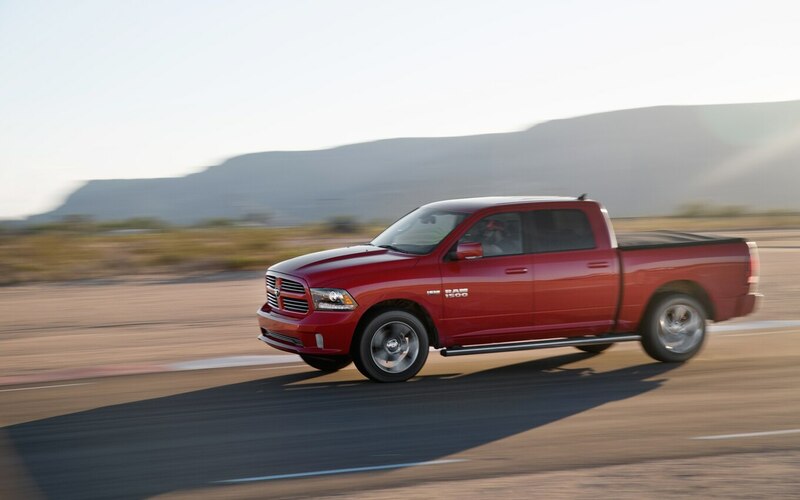 This combines with the redesigned body to lower the 1500’s coeffecient of drag from 0.39 to 0.36, to net a 6 percent increase in aerodynamic efficiency. 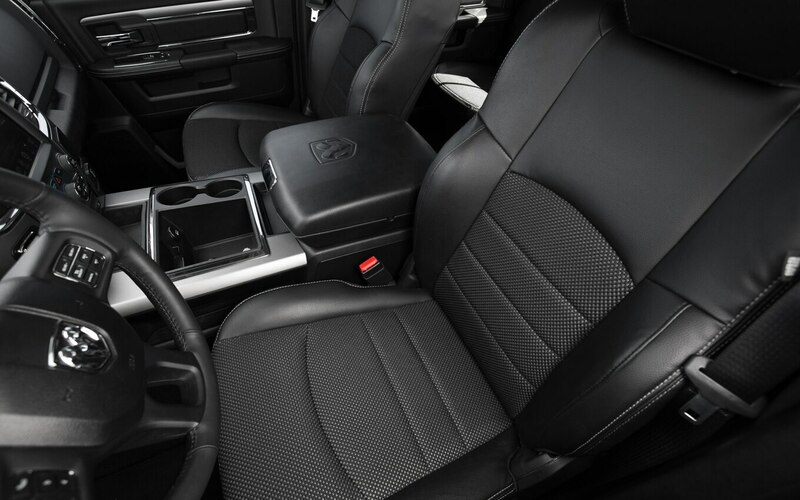 The interior has received as much attention as the outside. 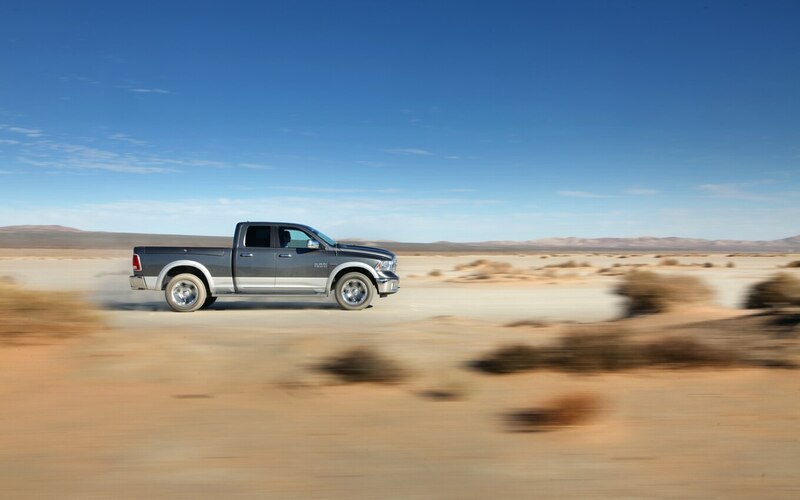 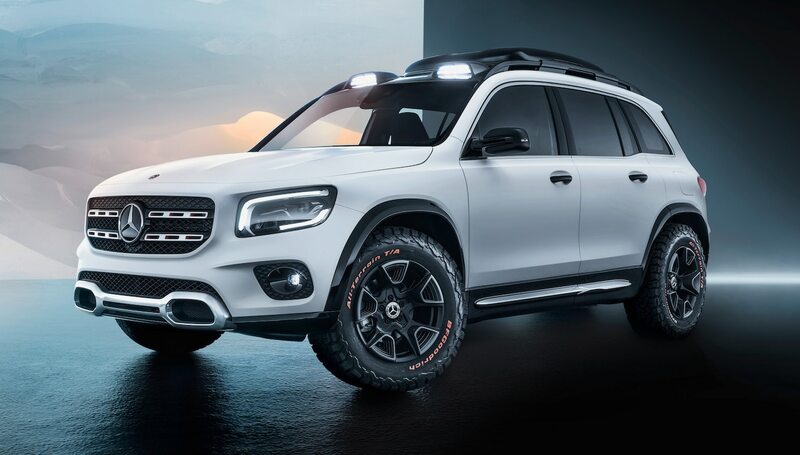 While the styling will be familiar to those who have driven previous-generation trucks, the technology inside is new. 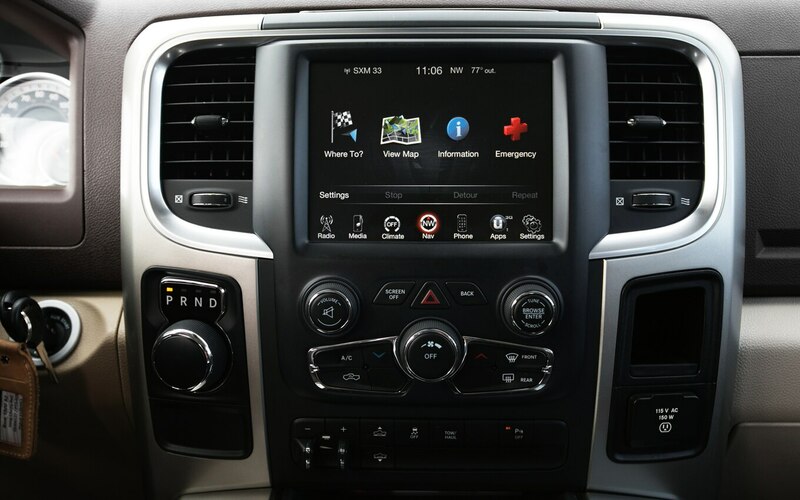 Chrysler‘s Uconnect is brighter and shinier than ever. 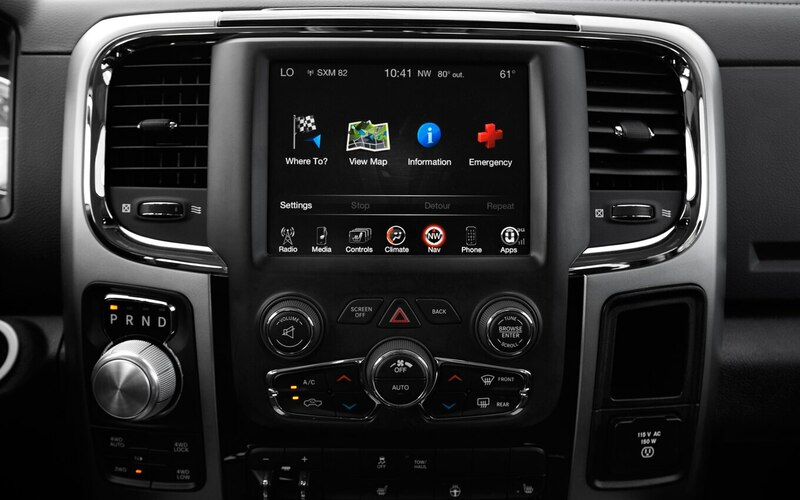 The main infotainment screen now measures 8.4 inches, the system is upgradable with apps, and it can provide an in-vehicle Wi-Fi hotspot. 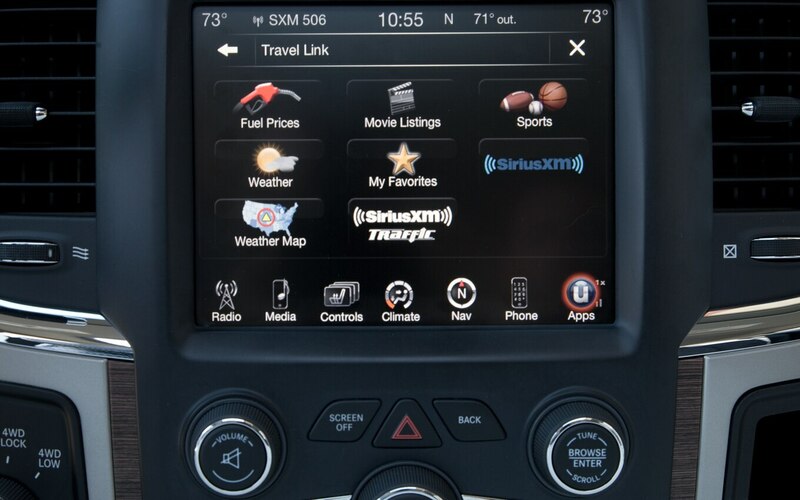 While we like its new look, we had some of the same problems we’ve had with the system in the past. 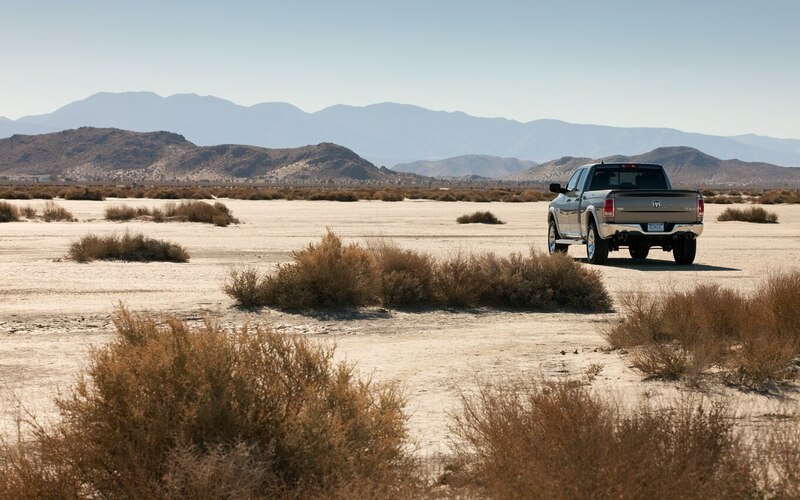 It was at times slow to respond, and the navigation system occasionally seemed to lose the truck while in motion, believing we were bounding along a few hundred yards off the highway we were traveling. 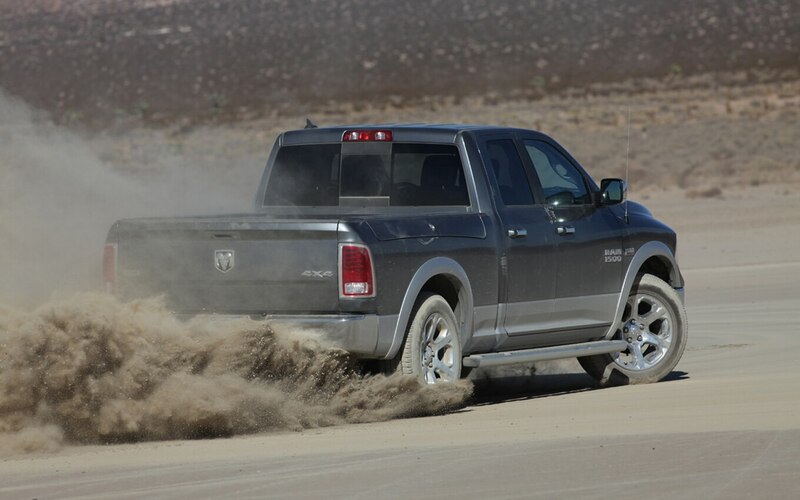 That’s not a huge problem when it thinks you’re barreling along through dirt, but it’s not good when the system thinks you’re on side roads and is giving directions based on those turns. 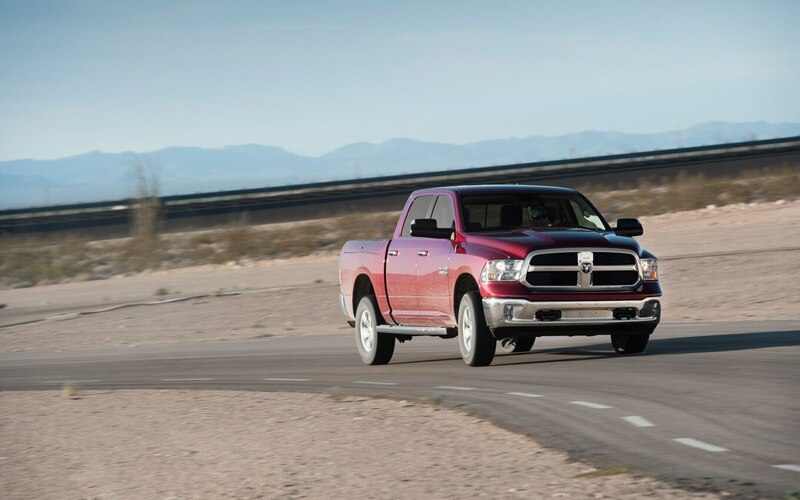 Also big news, according to Chrysler, is the eight speed’s twist-dial transmission control. 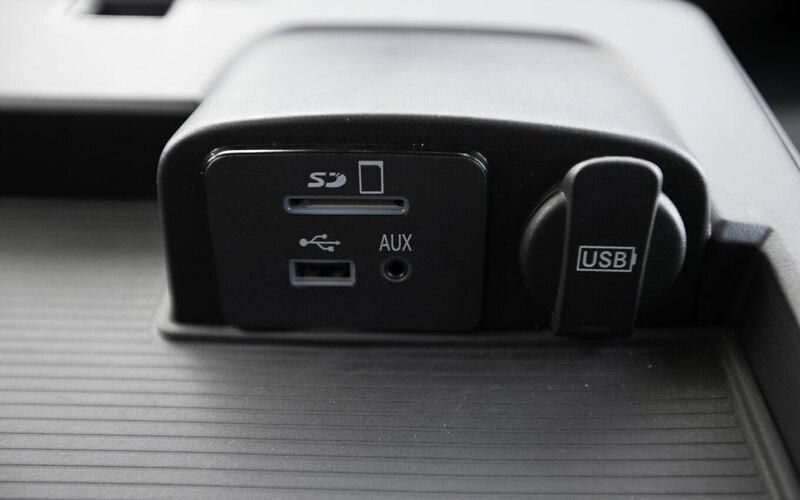 Some of our testers, myself included, found it untrucklike, but it is nice to have it mounted on the dash and not on the column or console. 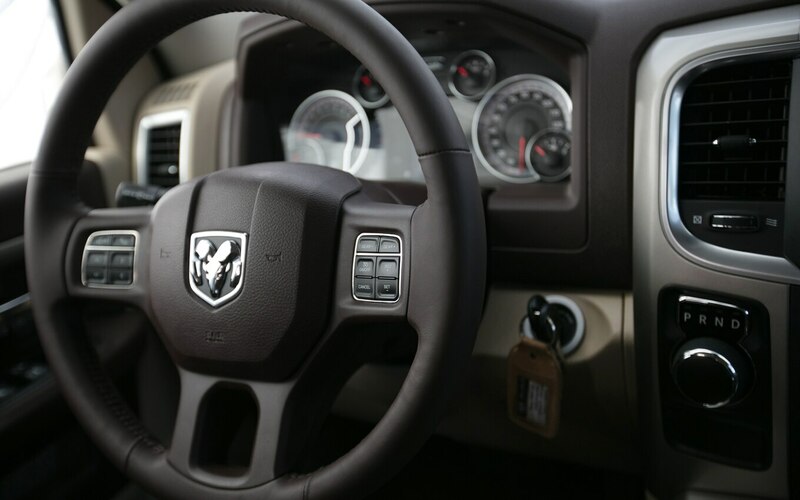 We disagree with Ram’s assertion that it’s easier to operate while wearing gloves; it seems a column shifter is almost ideal for that. 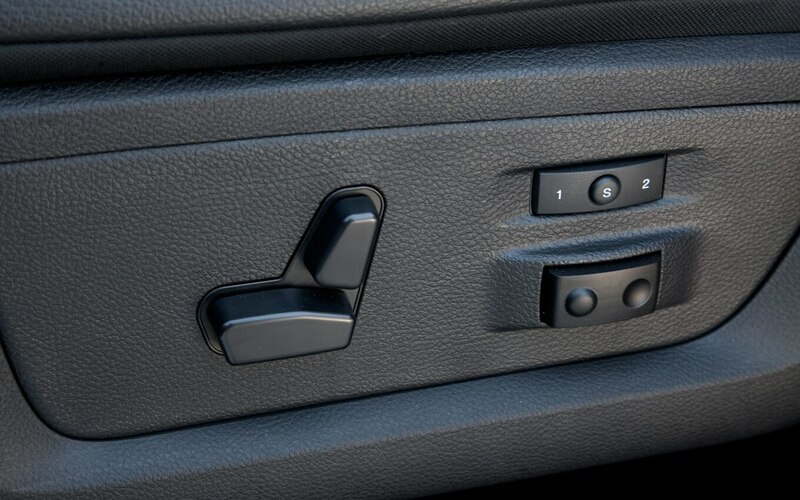 It is probably just a question of getting used to it, but I wasn’t the only tester to turn up the volume on the radio while trying to go from reverse to drive in a three-point turn. 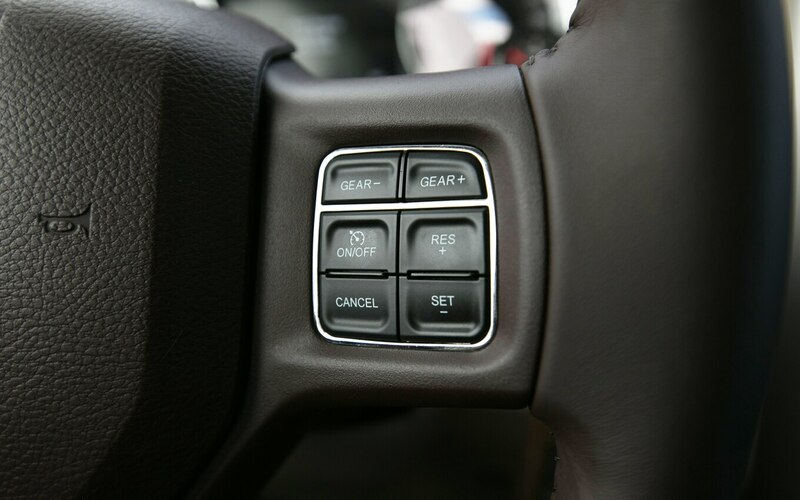 The other issue is the small, steering-wheel-mounted push buttons for manually shifting gears. 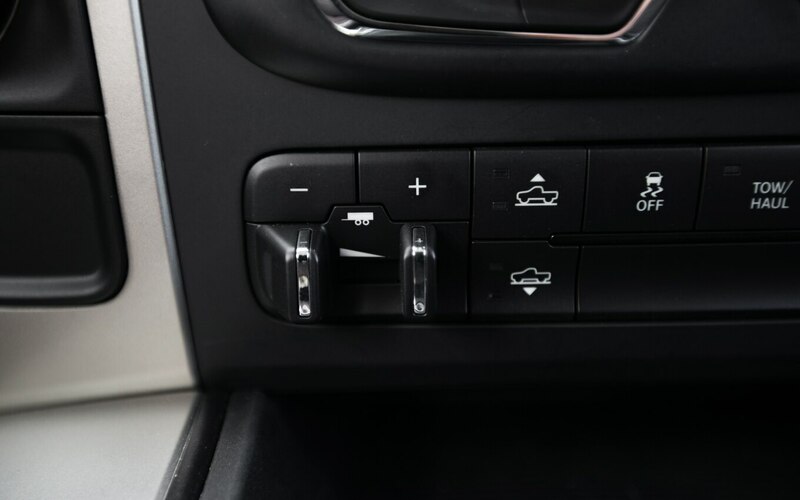 The upshift/downshift buttons are located right above the cruise control buttons and aren’t well-differentiated. 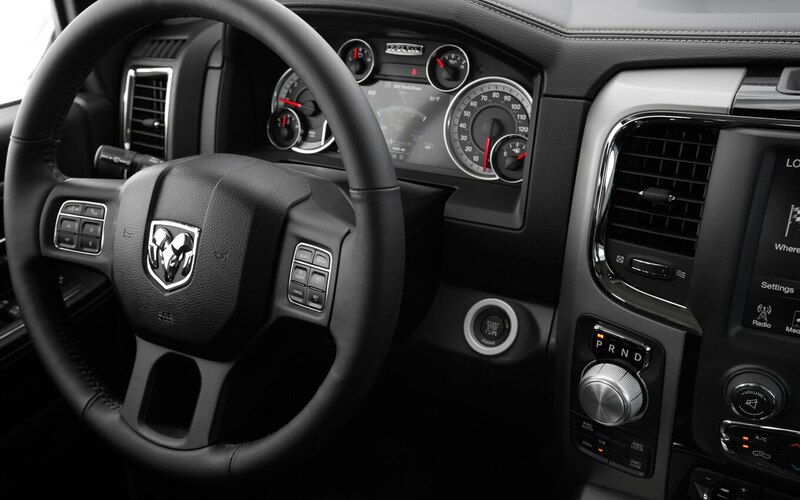 If Ram is truly concerned about drivers being able to operate everything while wearing gloves, the buttons are not the answer. 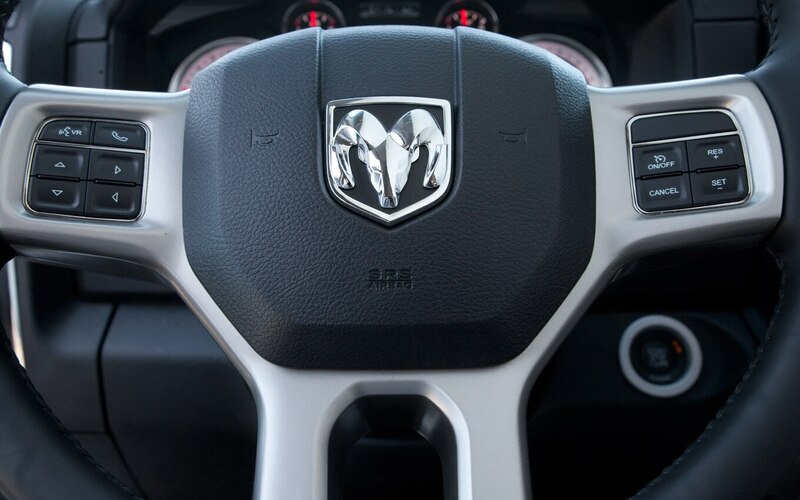 Paddles are the answer. 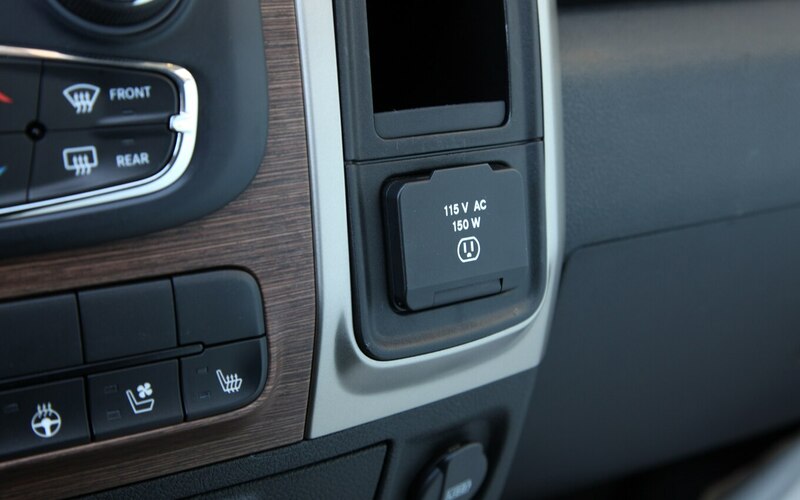 The car industry figured it out several years ago; and although people keep trying different things, the answer is paddles. 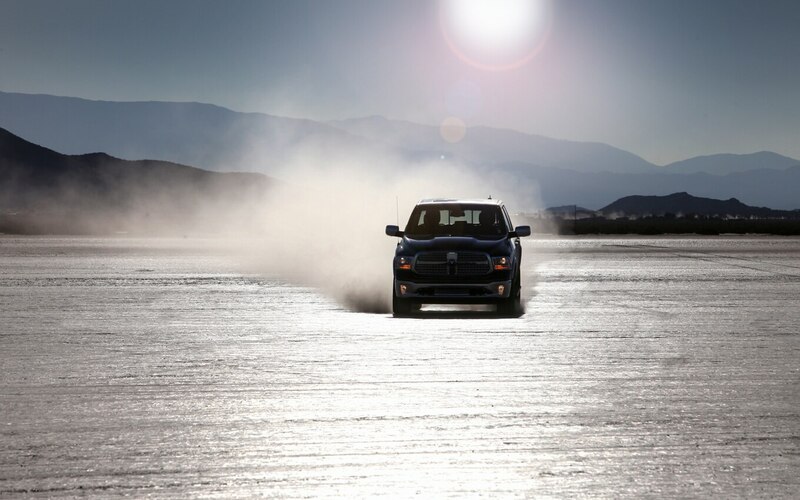 The V-8 Sport is a completely different animal. 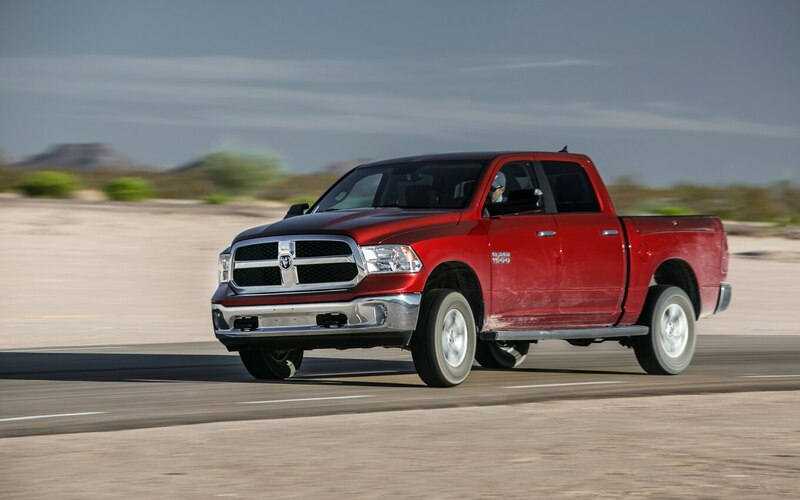 Obviously, 407 lb-ft of torque and 395 hp make it significantly faster, but the trim level brings a completely different experience as well. 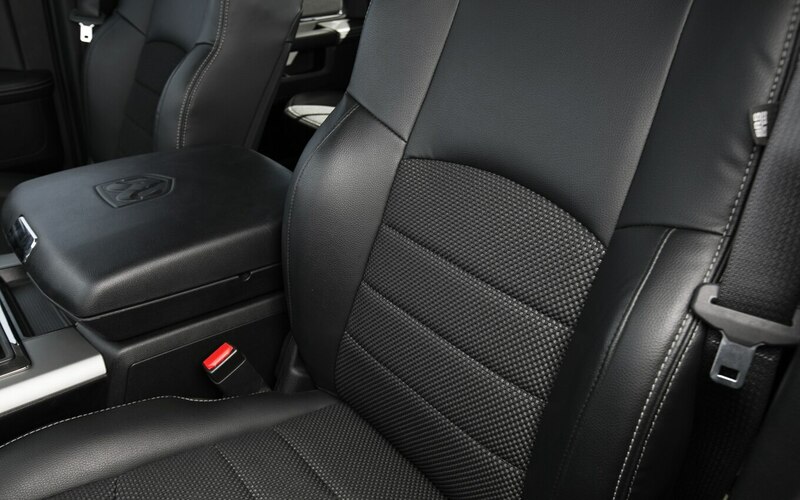 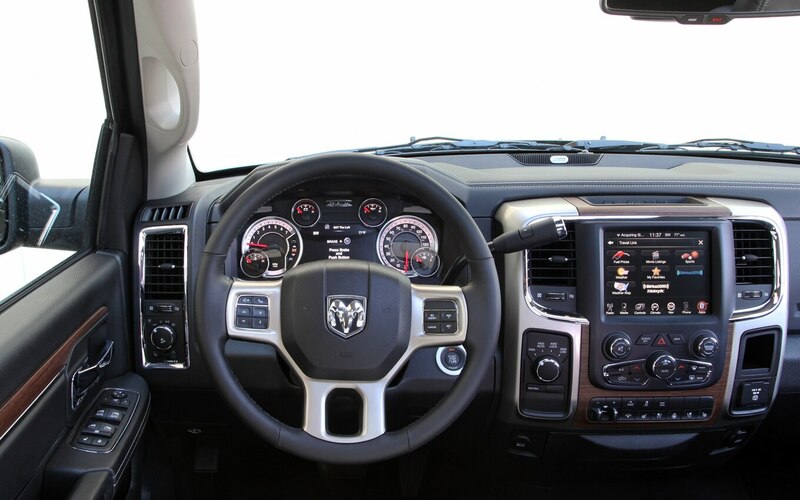 The interior is reminiscent of an SRT vehicle, with the same seats and similar overall feel. 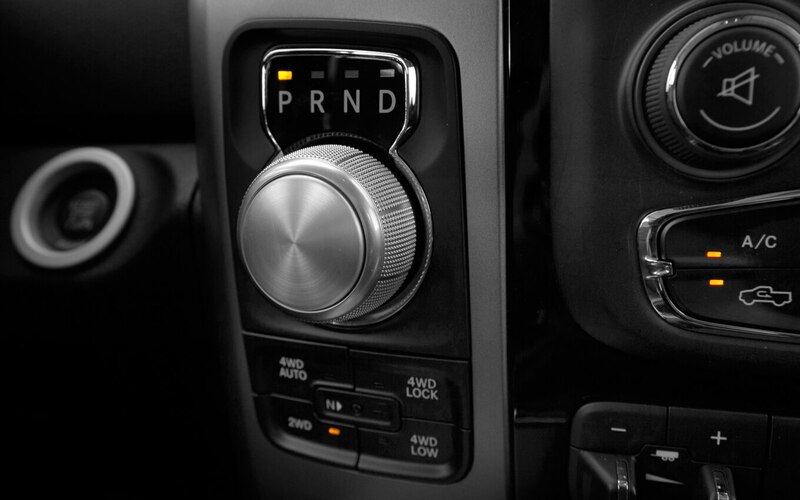 Things are louder in the Sport–from road noise to engine note, everything is far more obvious inside the cabin. 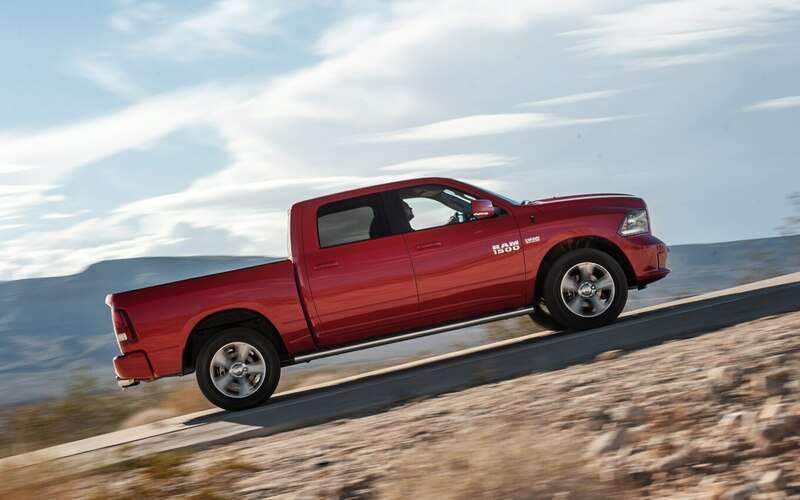 The anti-roll bars and coil springs permit less body roll in corners, but the ride feels less controlled. 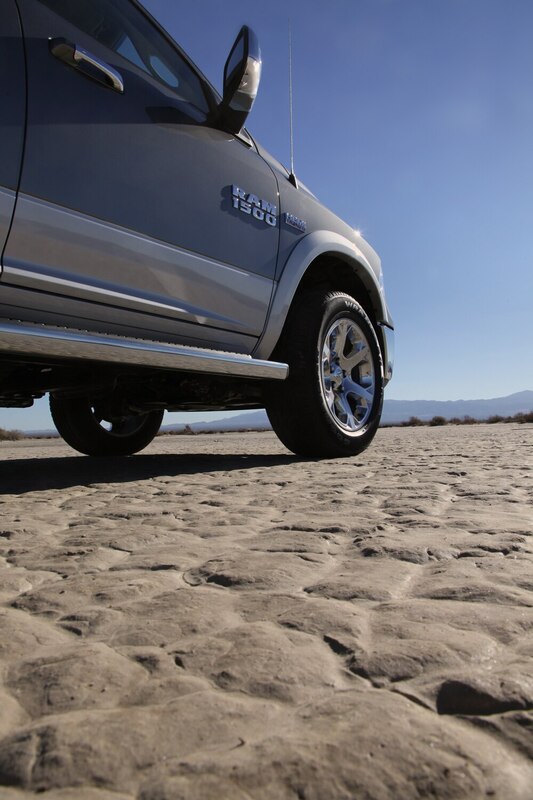 The steering is equally as slow on-center, but grip is increased with the bigger tires. 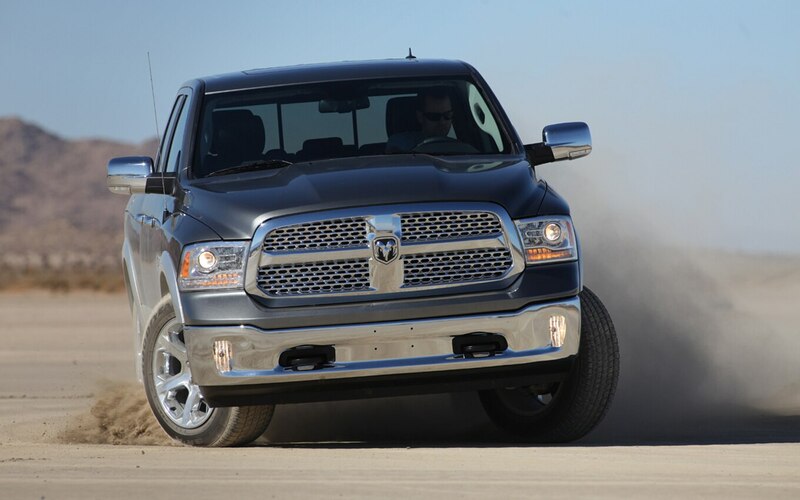 During 0-60-mph testing, it was difficult to get the rear end to hook up. 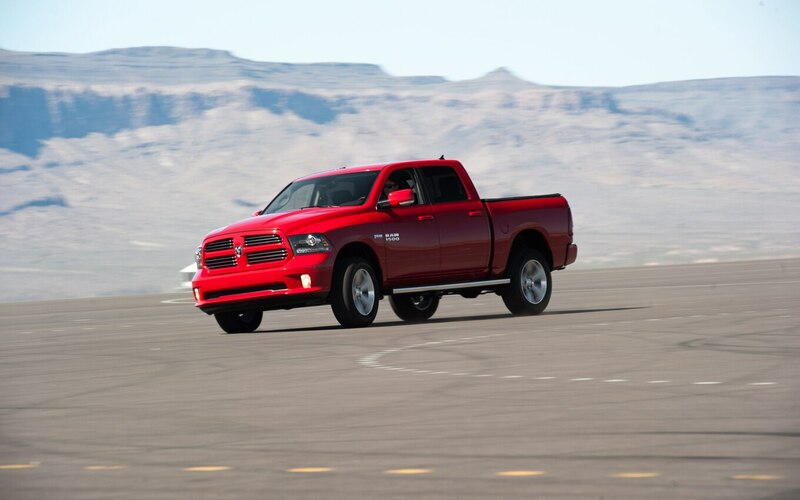 With a good launch we were able to get a 6.9-second 0-60-mph time, with 15.4 seconds at 88.6 mph in the quarter mile. 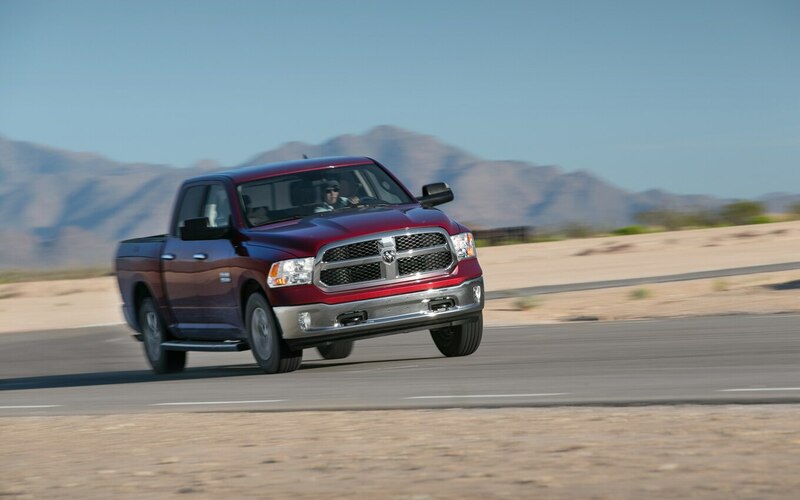 Pretty impressive numbers, even if they were edged out by the EcoBoost. 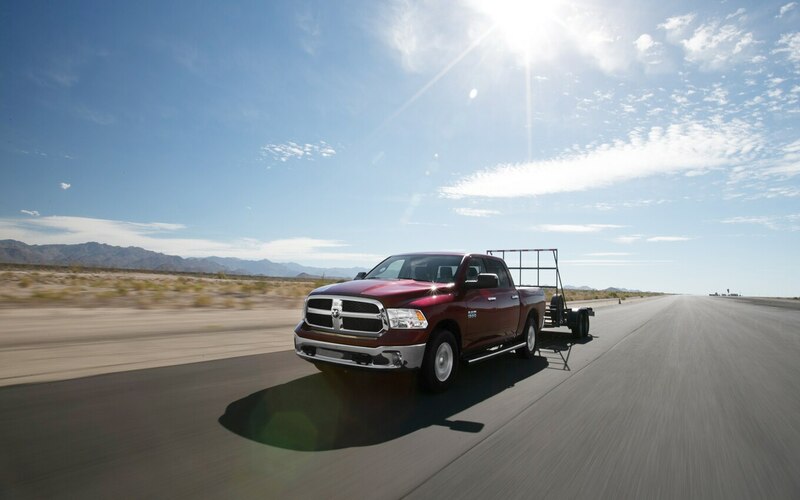 Acceleration with a trailer is where the V-8 came alive. 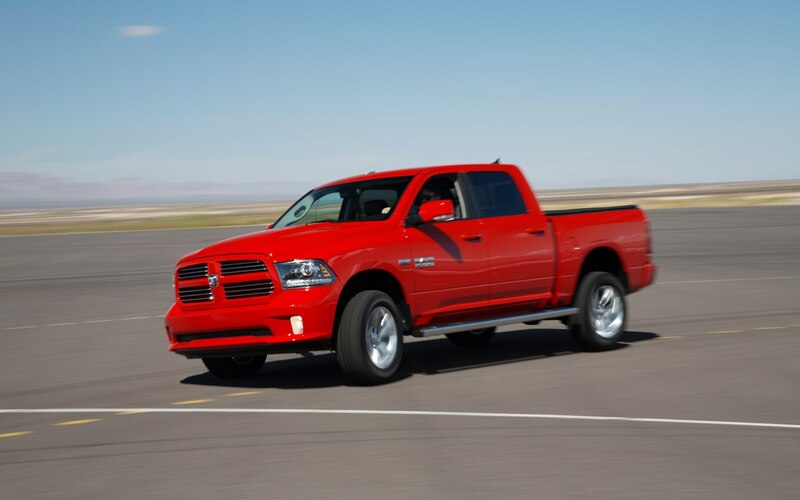 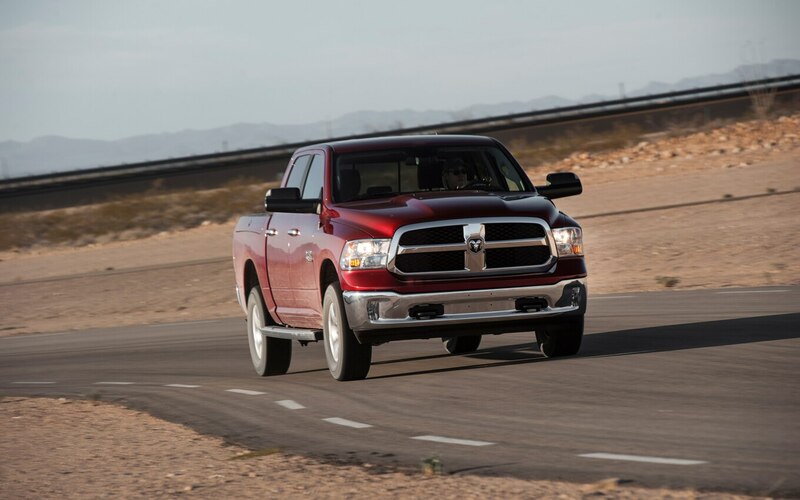 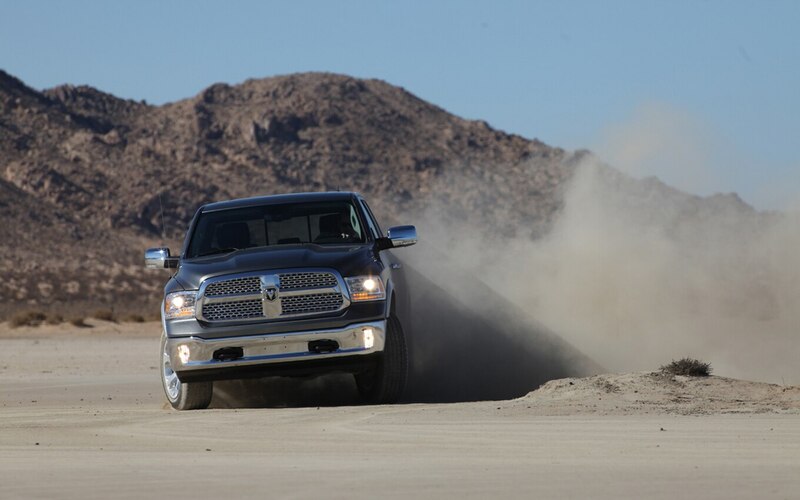 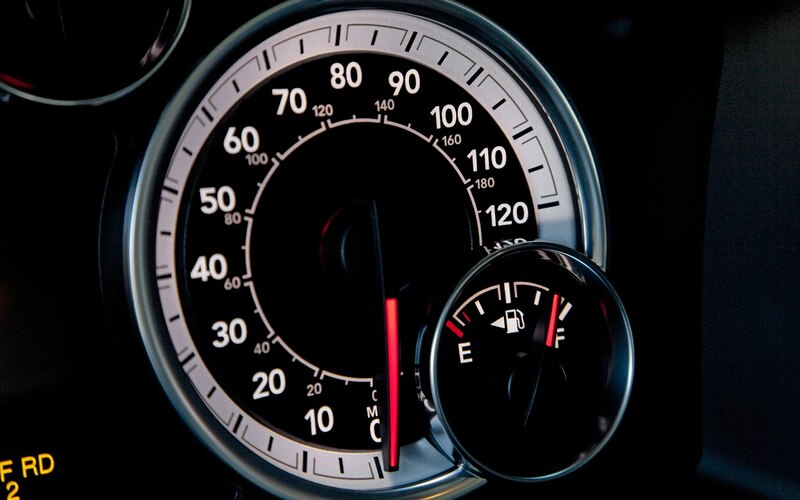 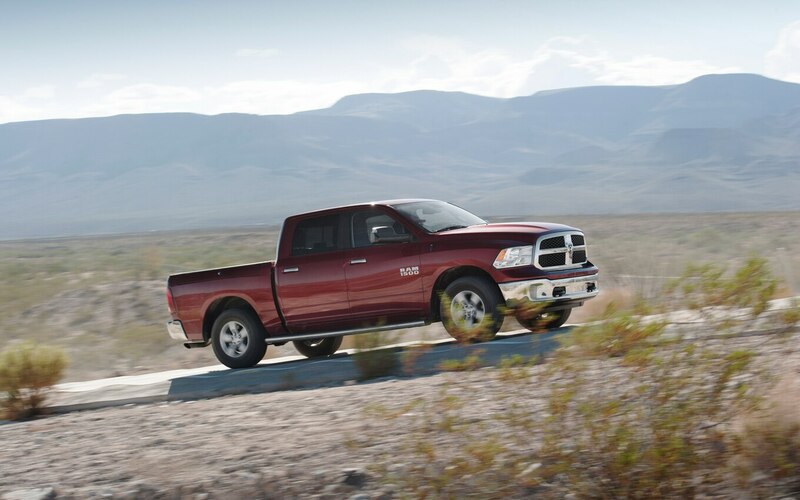 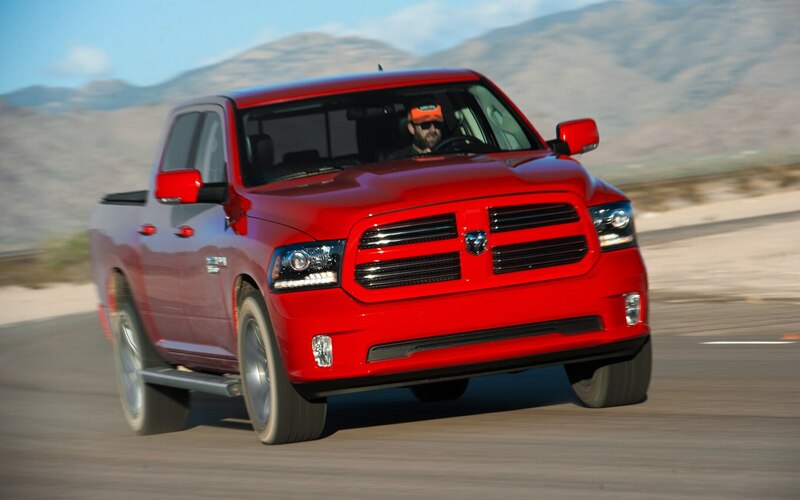 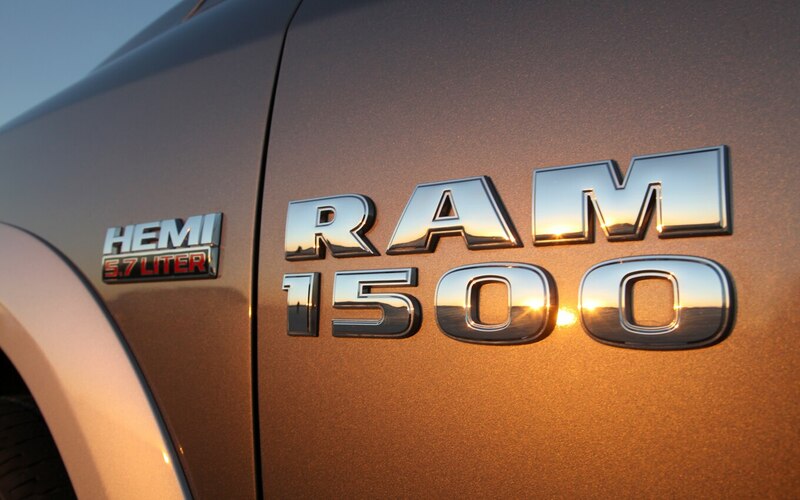 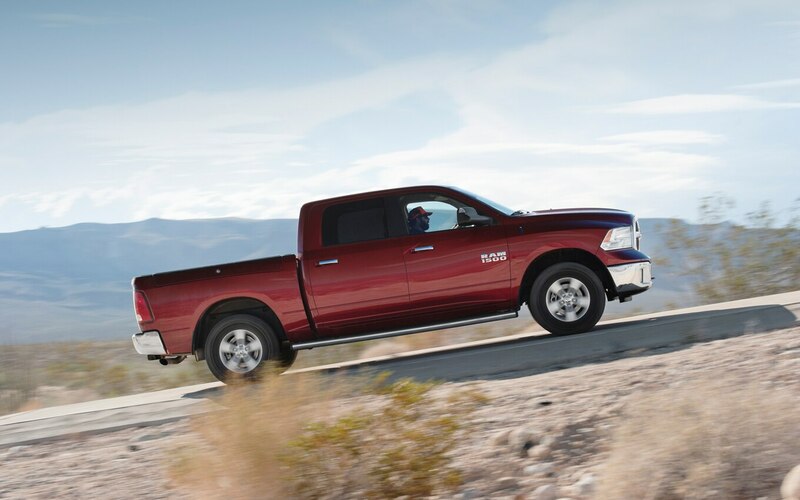 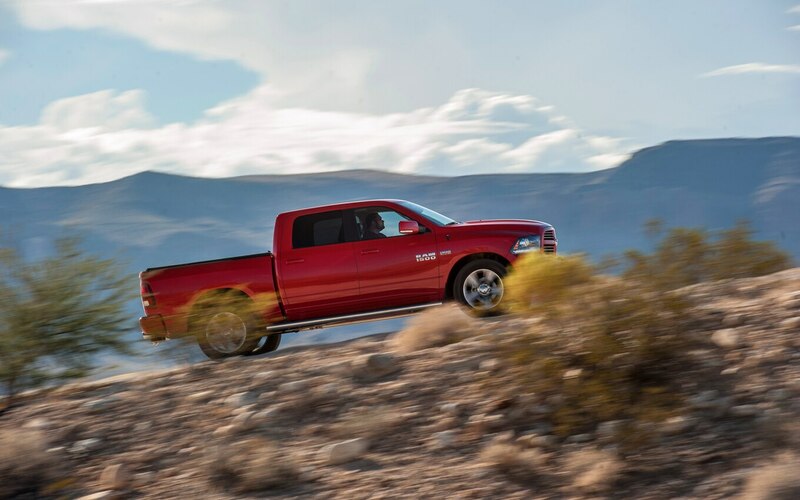 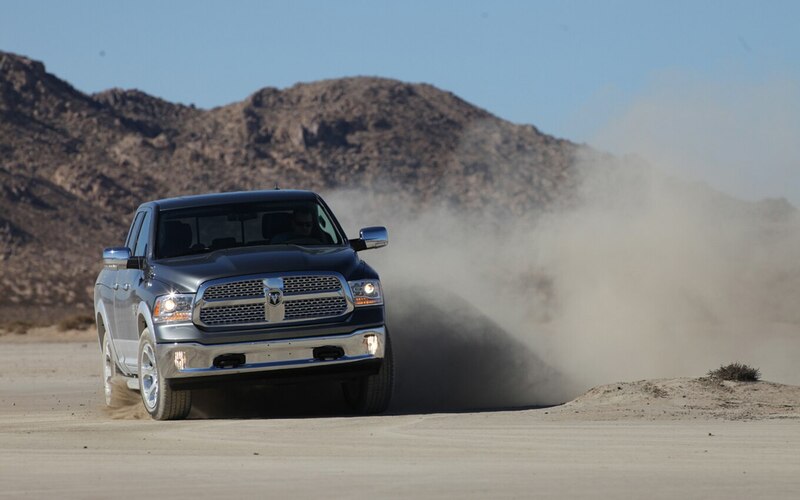 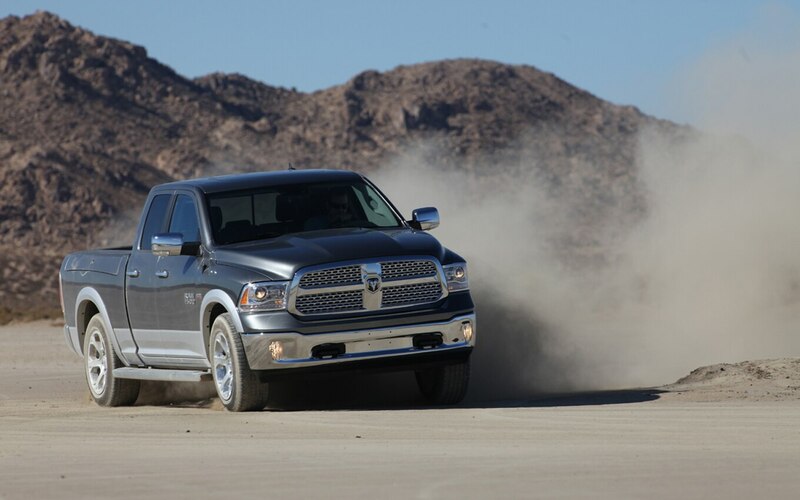 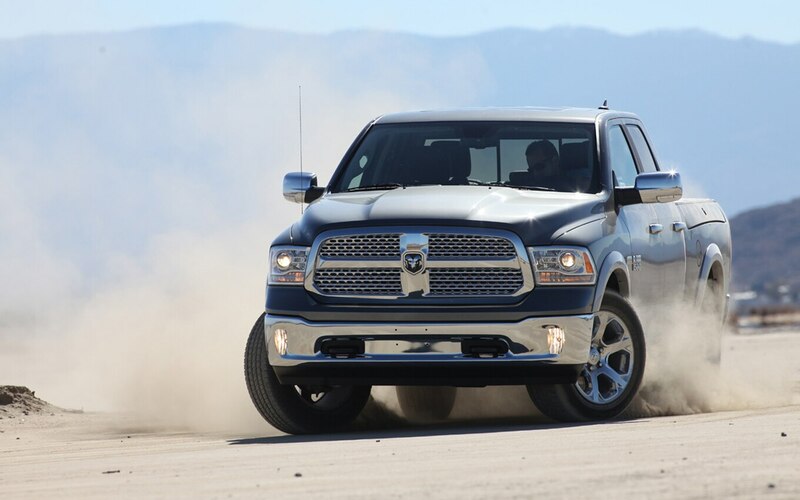 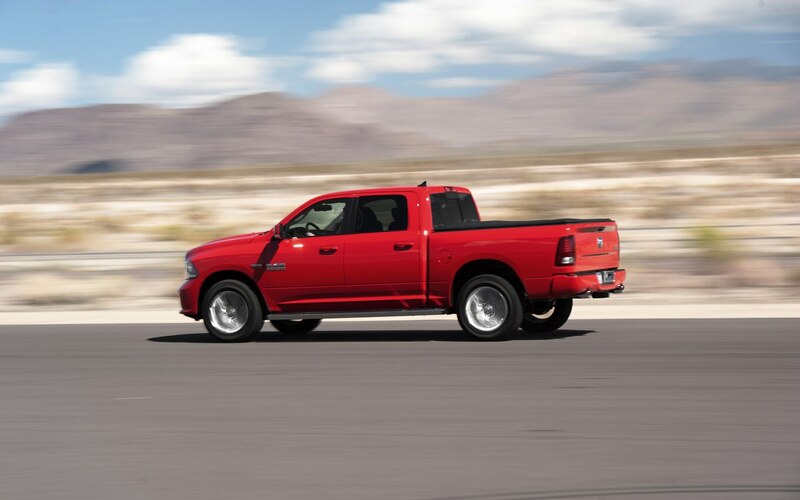 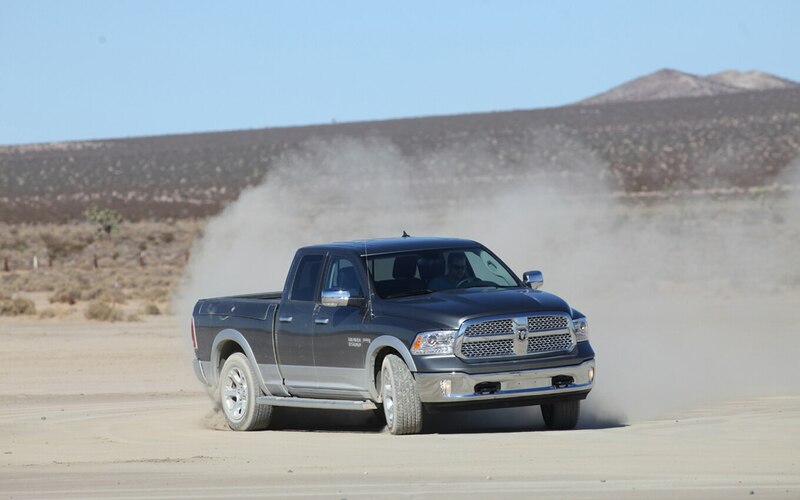 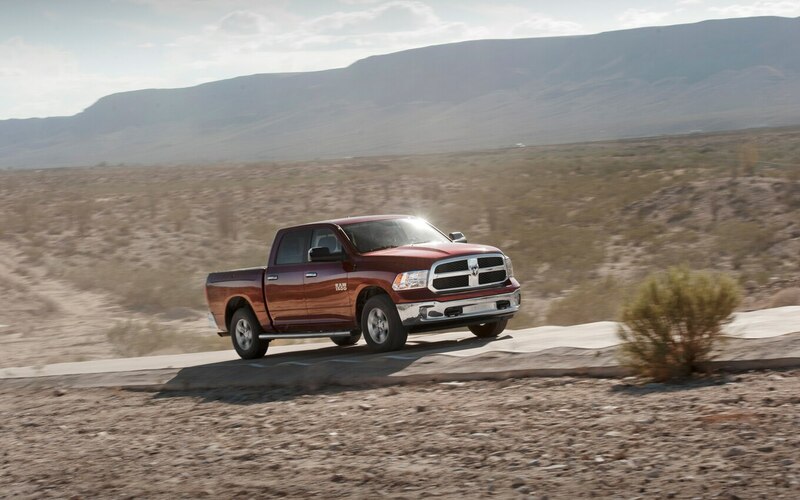 While the F-150 needed 15.7 seconds to get to 60 mph, the Ram did it in 15 seconds flat. 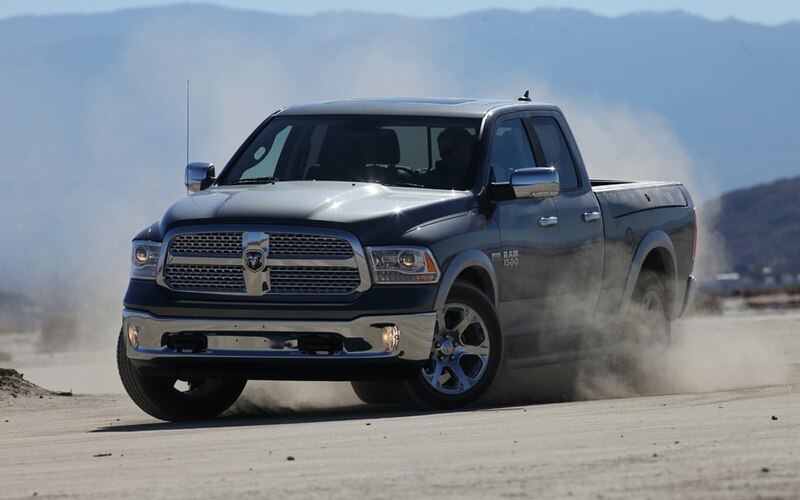 The quarter-mile advantage went to the Ram V-8 with a 20.0-second run at 69.4 mph compared with the Ford’s 20.5 seconds at 67.5. 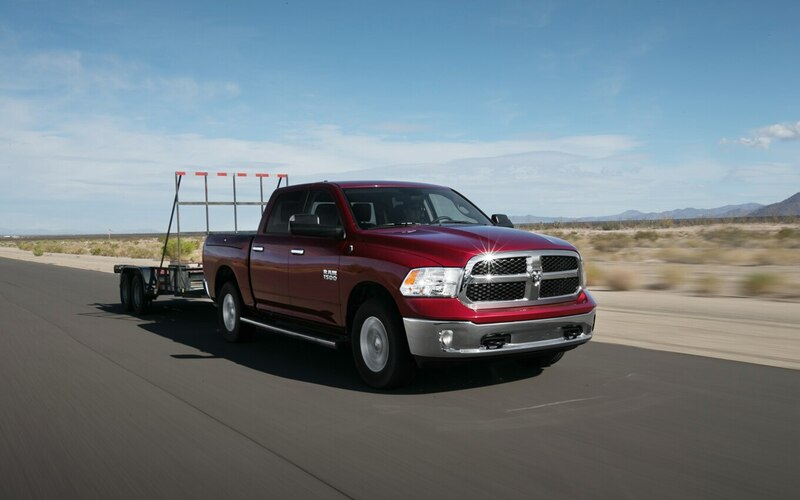 The V-8 Sport also was the subjective choice for towing. 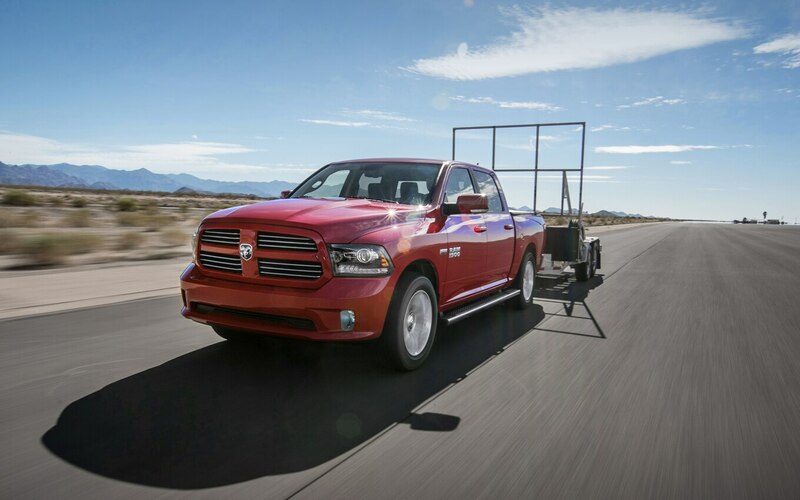 With 75 percent of its total towing capacity, both the V-6 and V-8 Ram still proved decent performers. 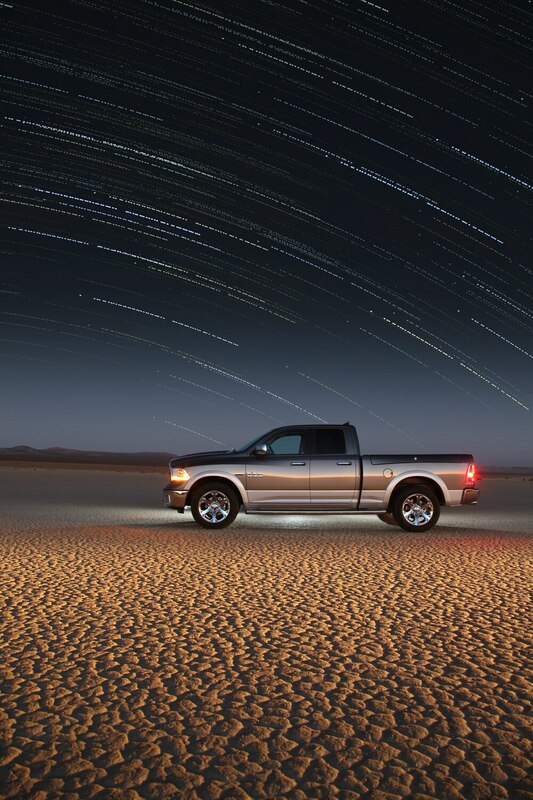 They felt more confident than the F-150, and ride quality even improved slightly with the V-8. 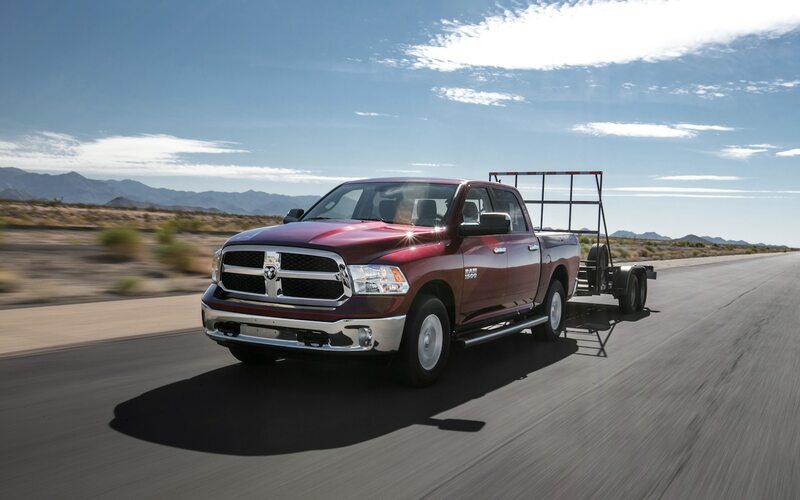 It took a couple tries to get the trailer brake calibrated to our liking, but familiarity with the truck would likely have sped up that process considerably. 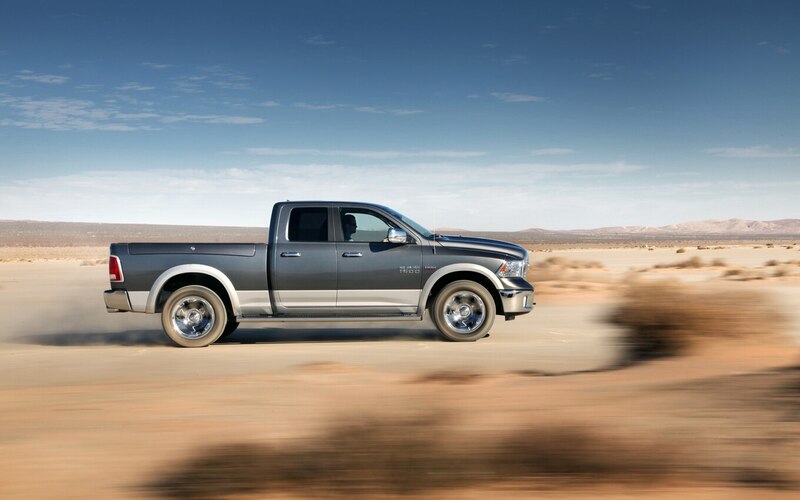 Although we’re still fans of the low-end torque generated by the EcoBoost, the Ram was more confidence-inspiring as a whole. 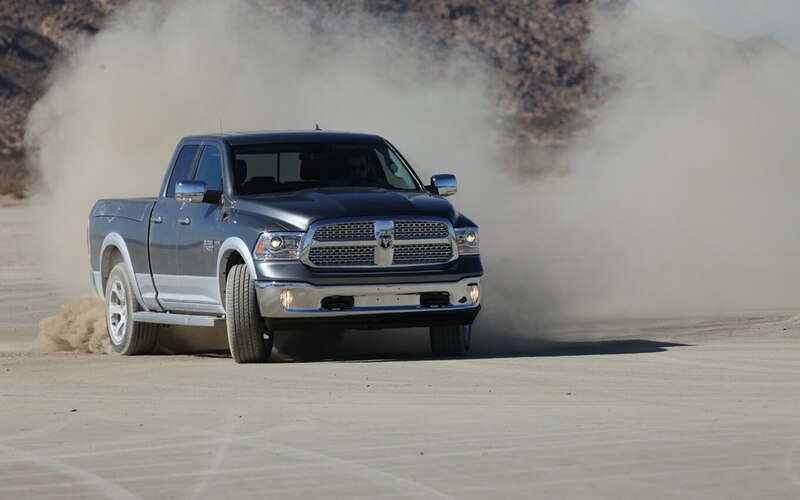 At the end of our testing, the decision was unanimous. 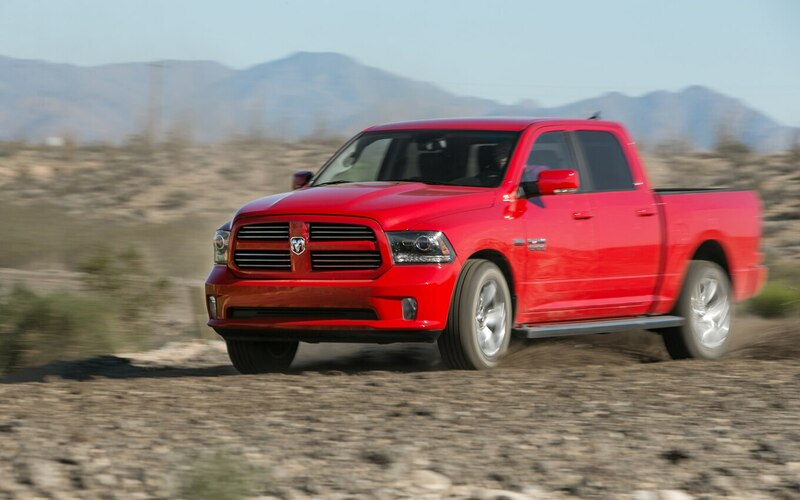 Hands down, the Ram ran away with this Truck of the Year award. 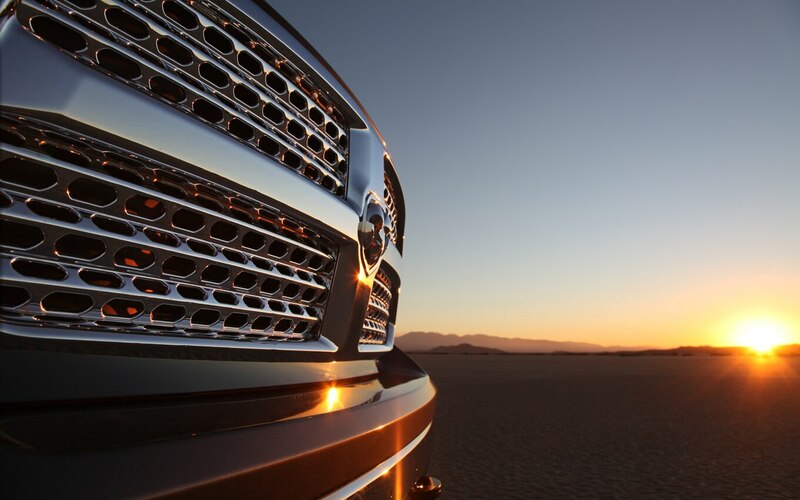 The V-6 fills the void where the Dakota once existed. 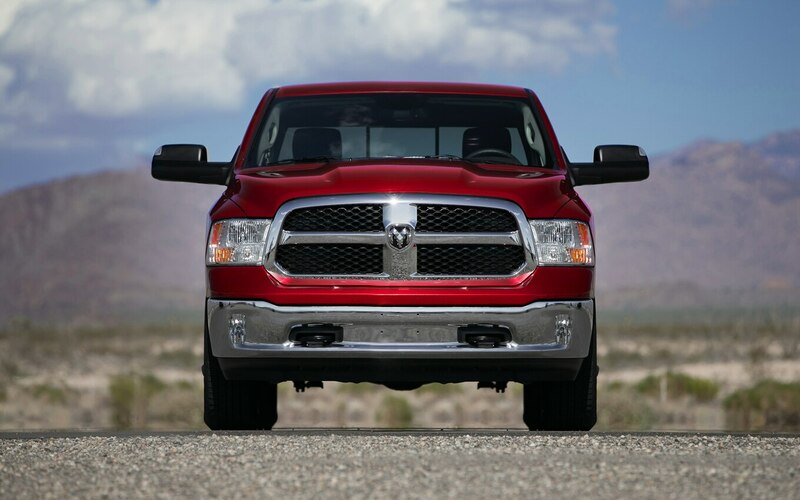 The V-8 is as much if not more truck than we expect to find in a 1500. 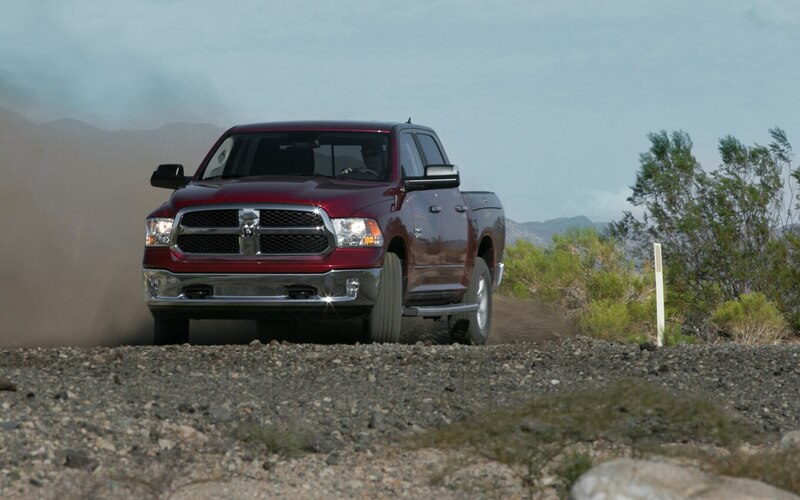 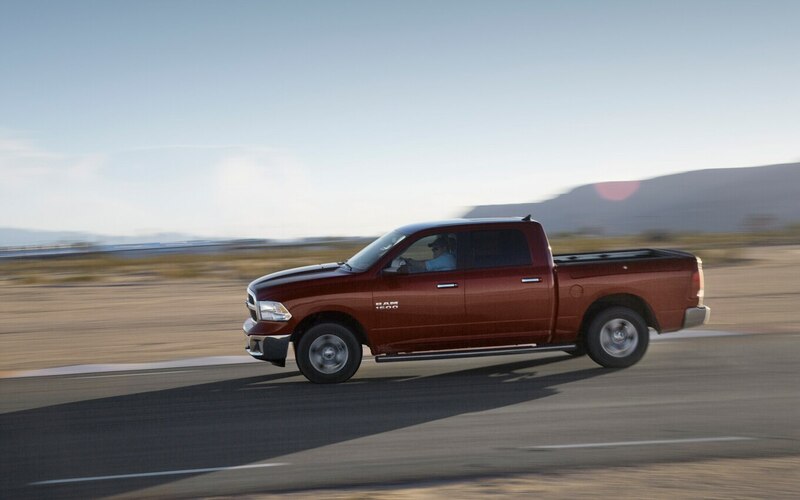 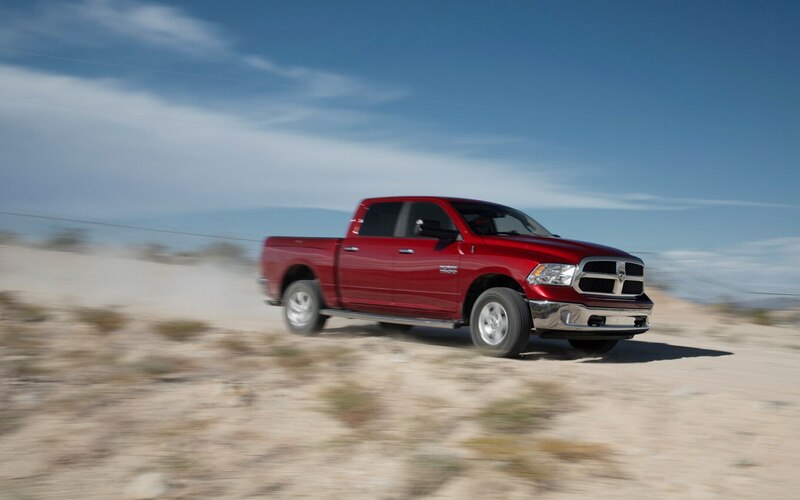 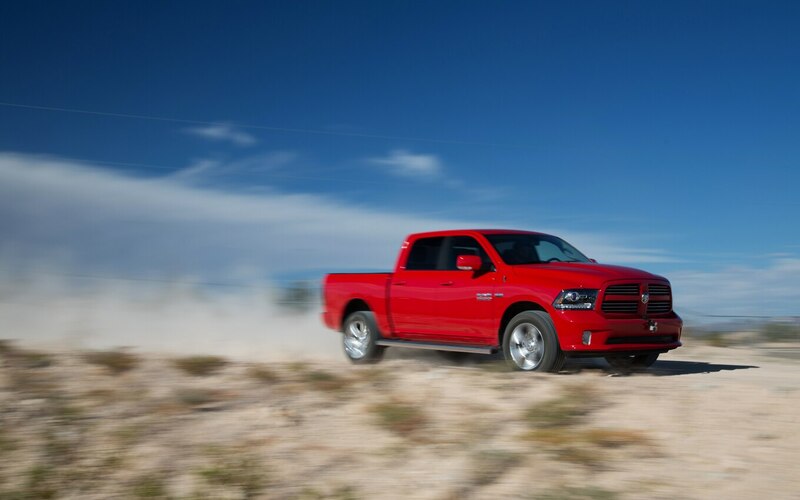 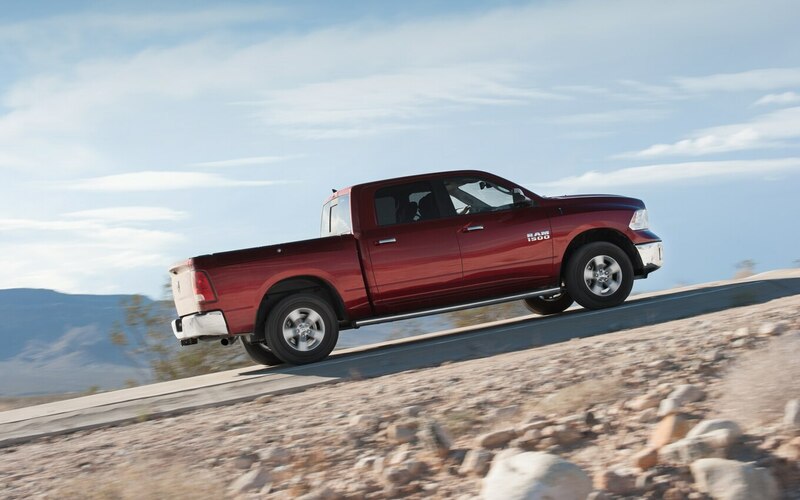 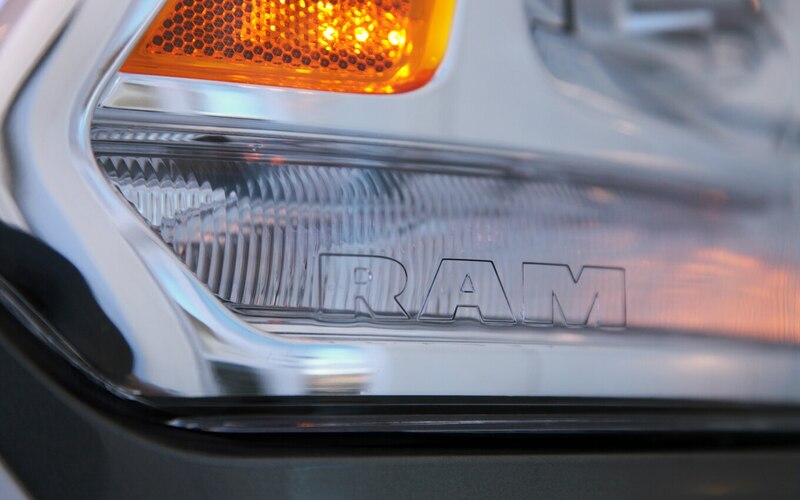 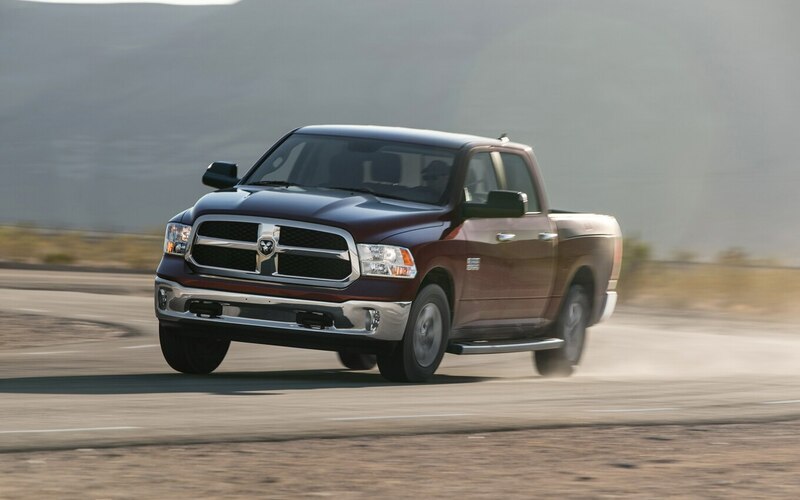 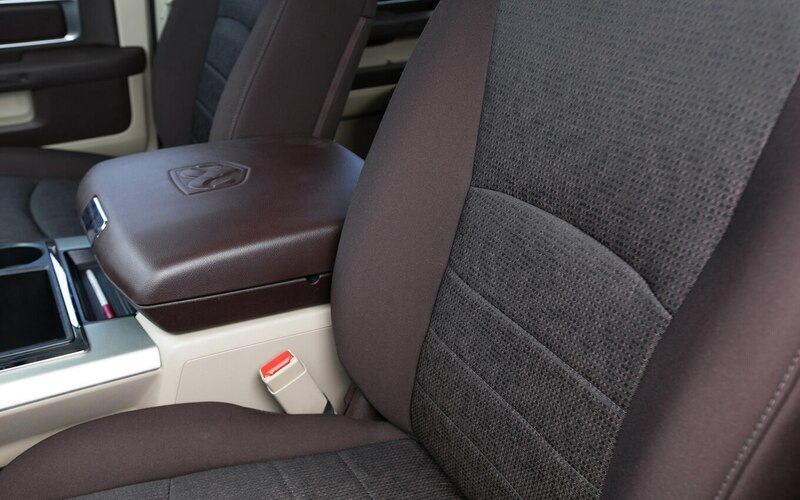 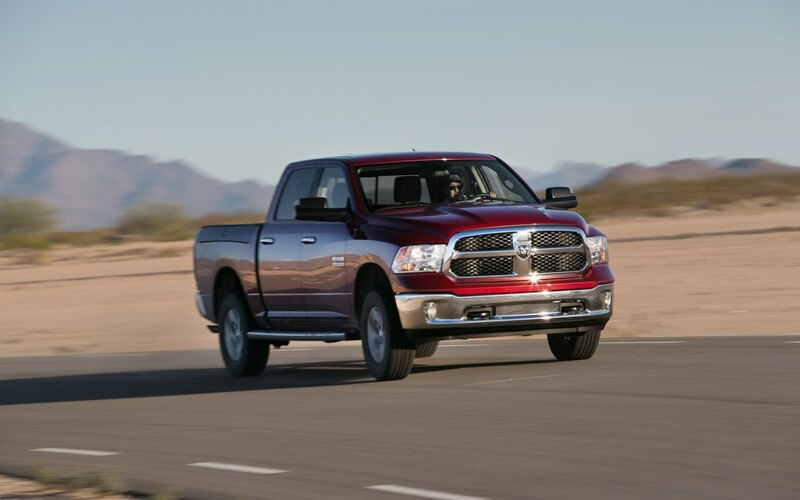 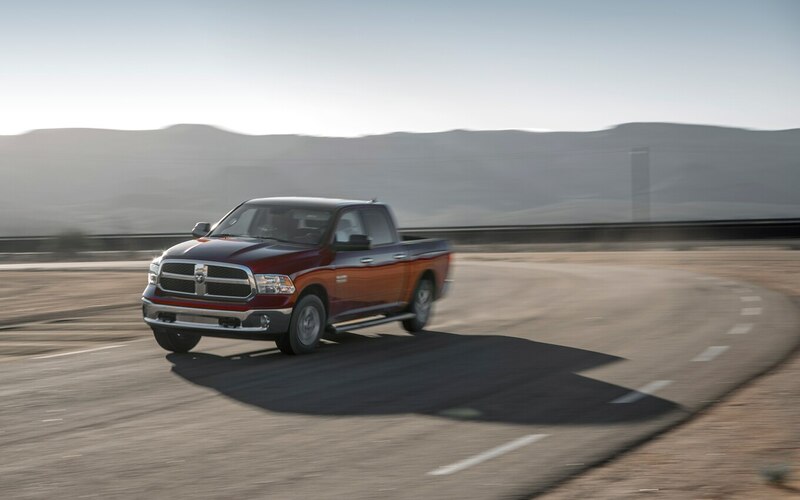 The variety of trim levels offered by Ram can give you everything from a very basic work truck to a near-luxury vehicle with performance and off-road models falling somewhere in between. 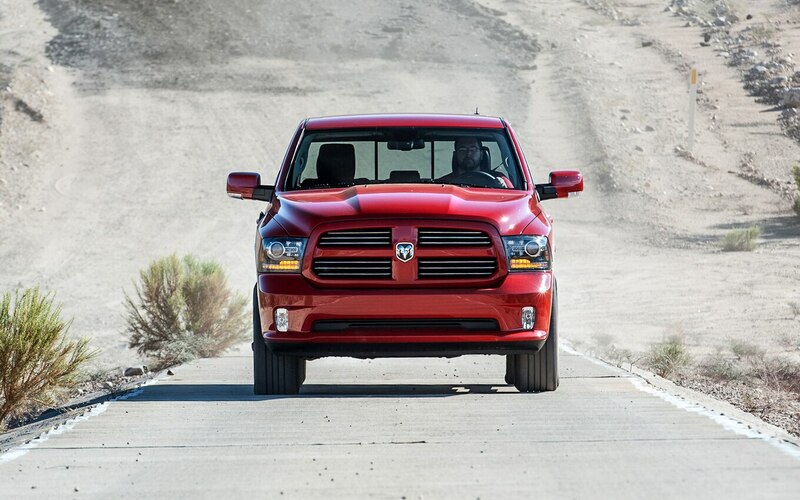 It ticks all six boxes in judging criteria. 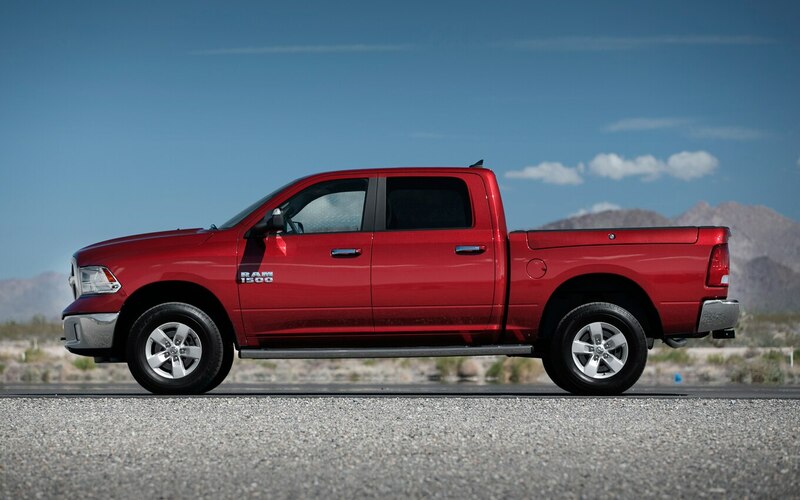 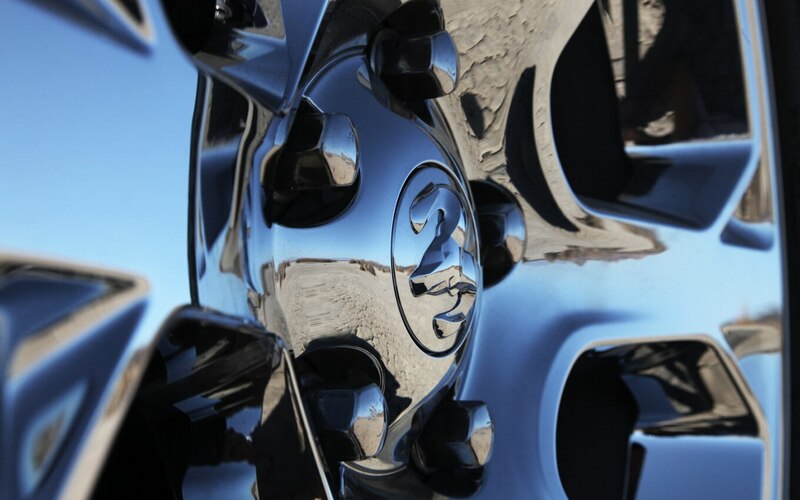 With loyalty higher in this segment than just about any other, we do wonder how many truck buyers are willing to switch brands. 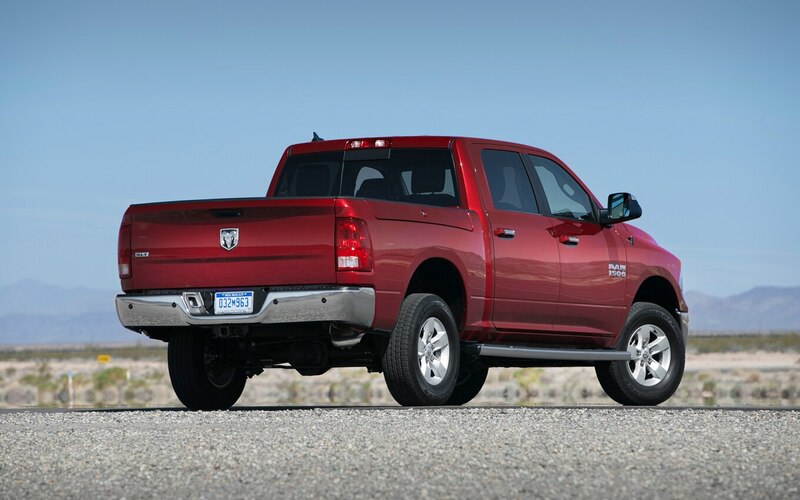 Until the rest of the industry can catch up with Ram trucks in the half-ton segment, it would be a shame to pass this one up.